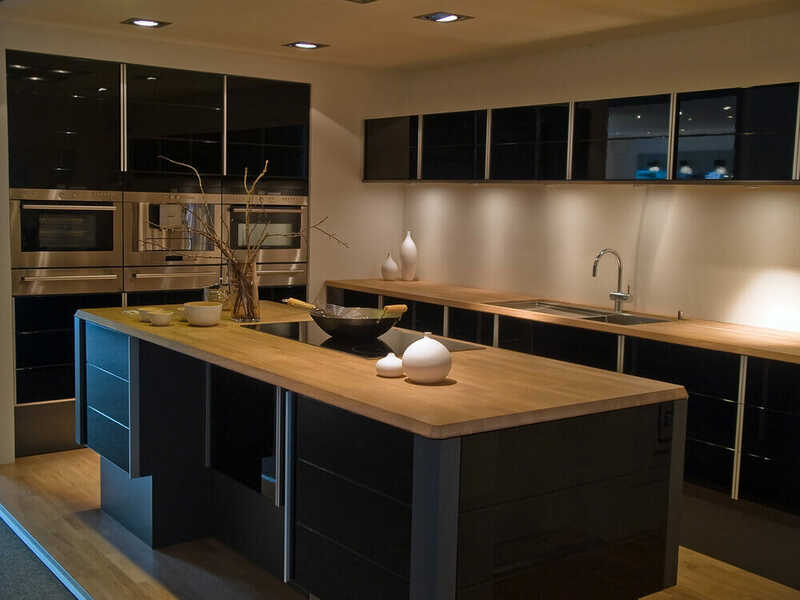 When speaking about modern kitchen designs there are common aspects that come to mind. 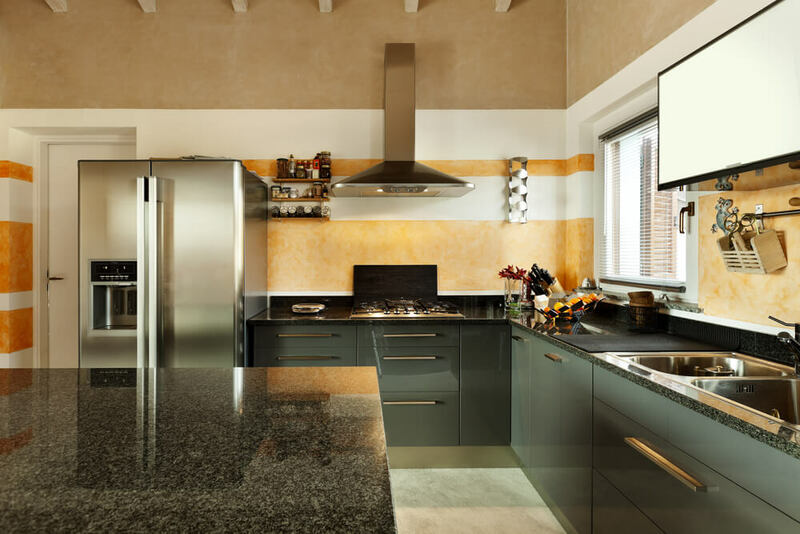 Clean lines, natural materials and simple ornamentation are elements commonly found in modern kitchen spaces. 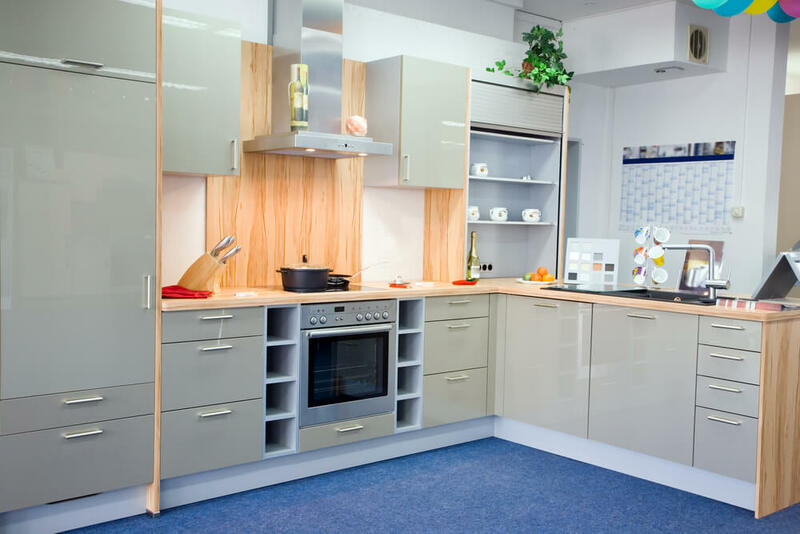 When speaking about modern kitchen designs there are common aspects that come to mind. 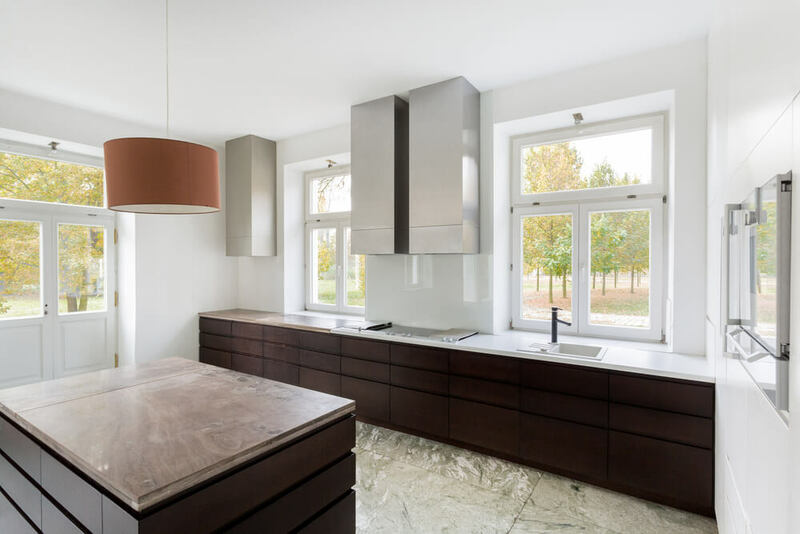 Clean lines, natural materials and simple ornamentation are elements commonly found in modern kitchen spaces. However, views may differ when it comes to what features truly fit the modern design aesthetic. 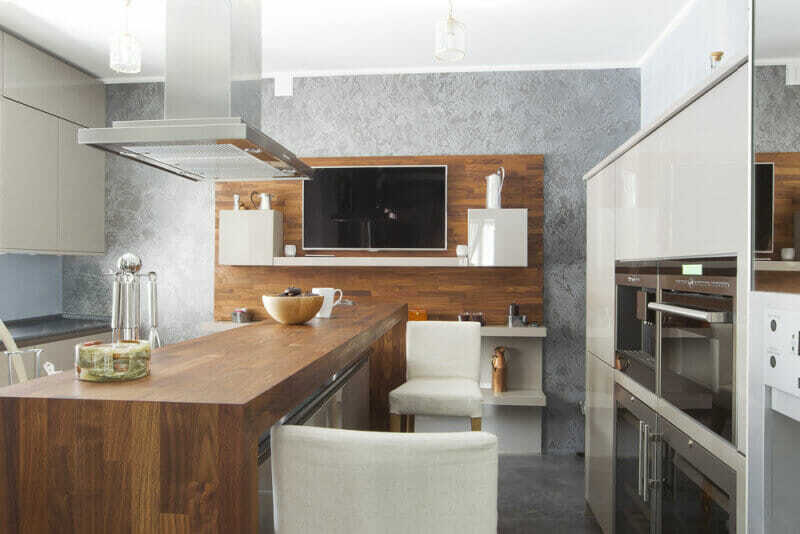 Therefore, when considering the installation of a modern kitchen in your home, here are a few design elements to look for to ensure that your space is truly modern. Flat-panel Door – The flat panel door is indicative of modern design in its simplicity and profile. The entire door is flat, with no area that is raised or inset. 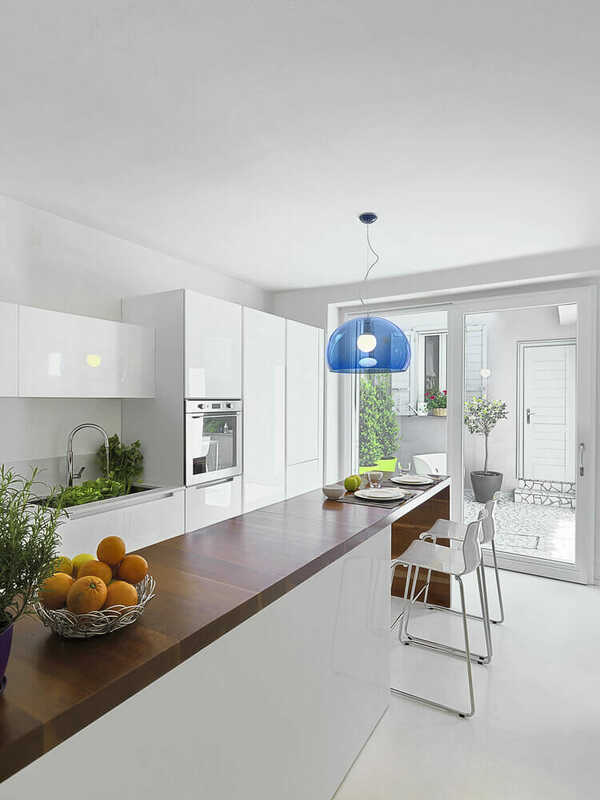 The Color White – While white is not exclusive to modern kitchen design, it is commonly used. 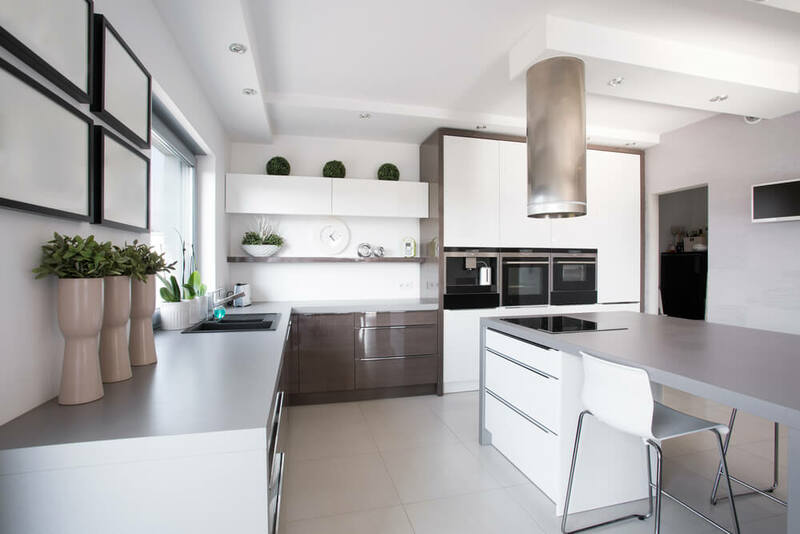 White is the color choice of many modern kitchens because it projects a sleek and simplistic design aesthetic. 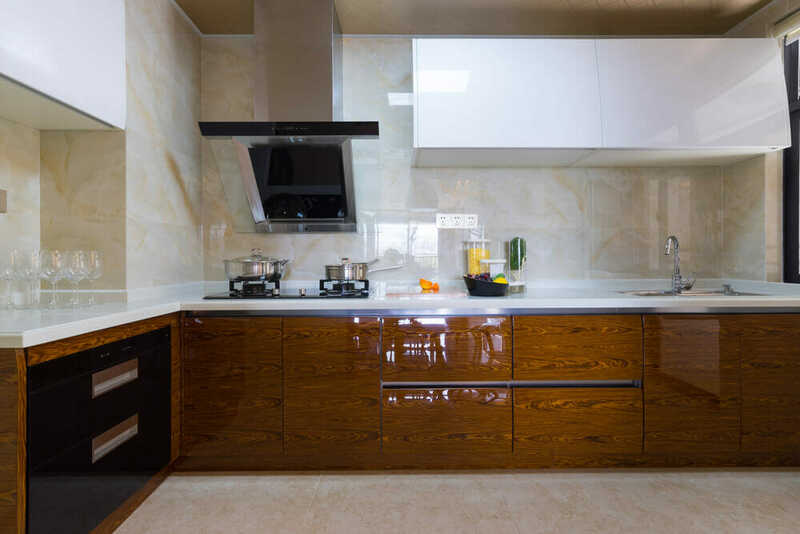 It also coordinates beautifully with natural wood elements and stainless steel, additional materials often found in this type of kitchen. 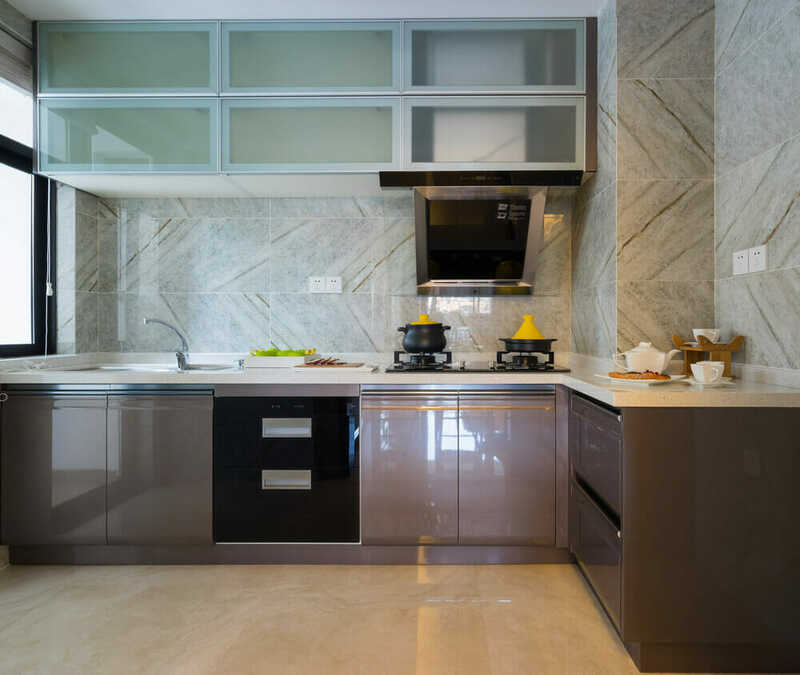 Horizontal Lines – This aspect of modern design can be seen in the layout and size of kitchen cabinetry, the design of a kitchen island or in the installation of open shelving. 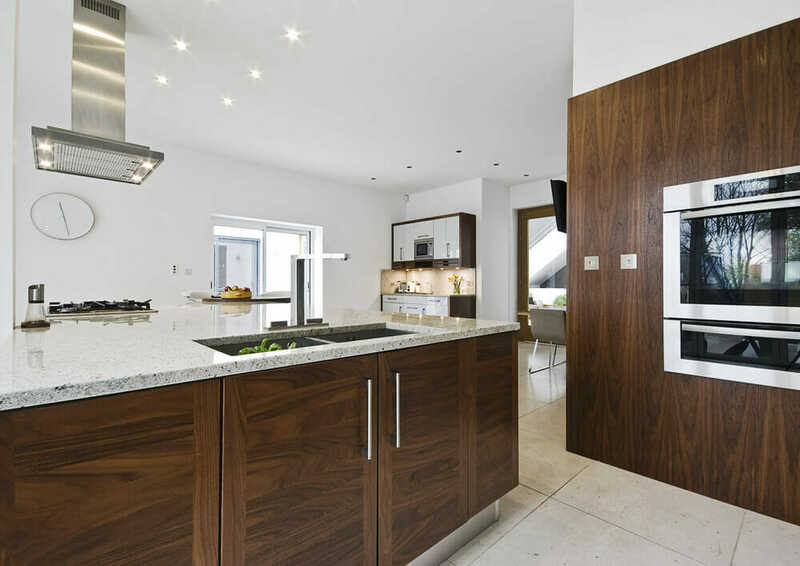 High-gloss – The majority of finishes in modern kitchens have that sleek, lustrous look. 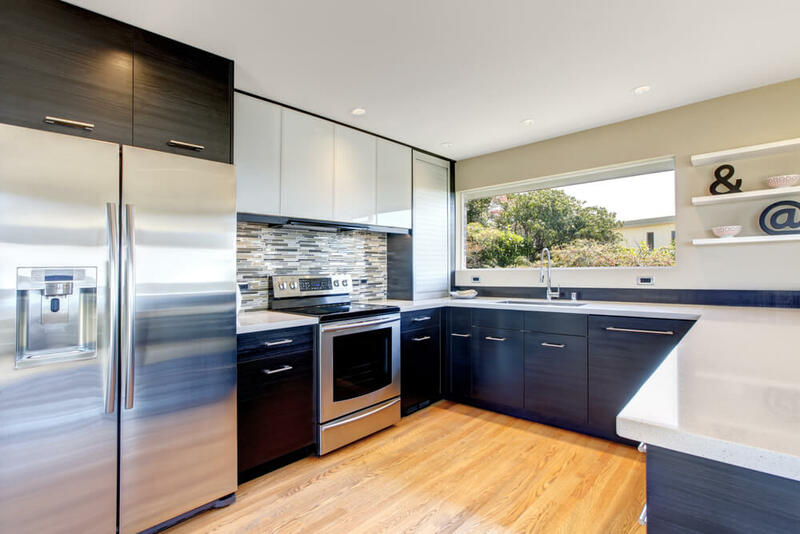 A high-gloss finish is often seen in cabinetry, backsplash and countertops. 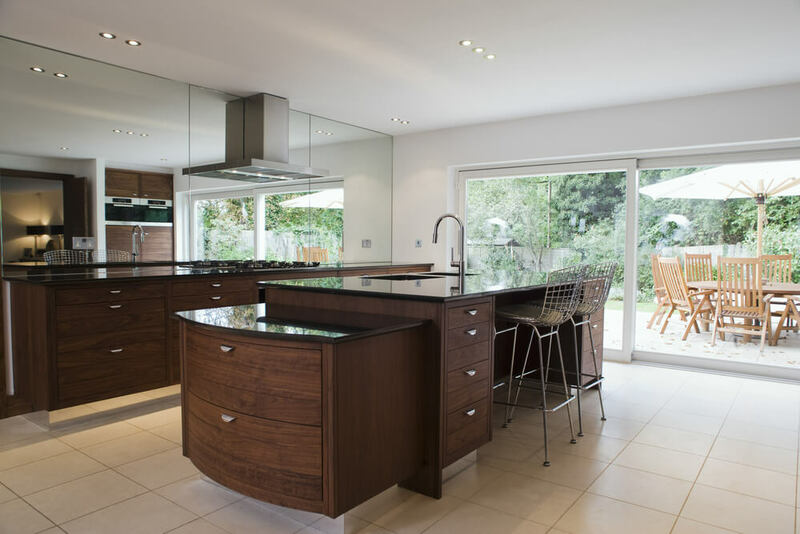 Consistency – True modern kitchen design is consistent. 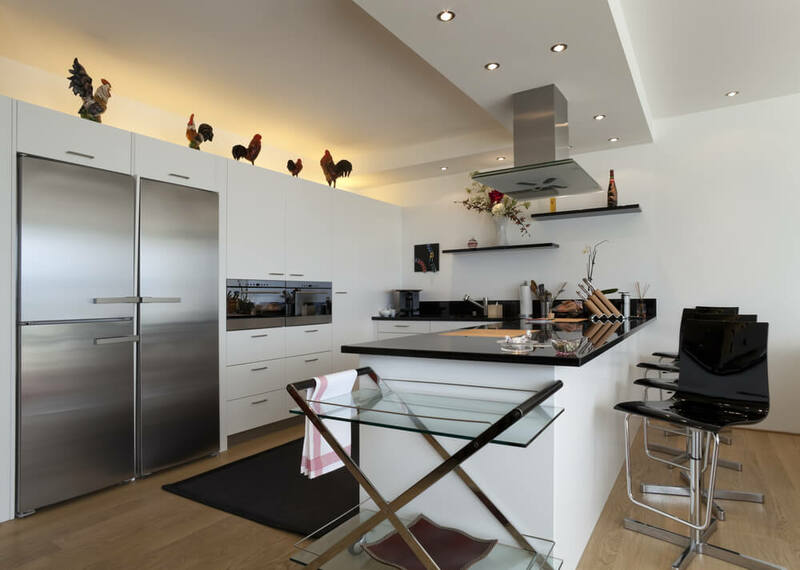 It does not deviate toward other design styles and will be evident in the kitchen furniture and accessories. 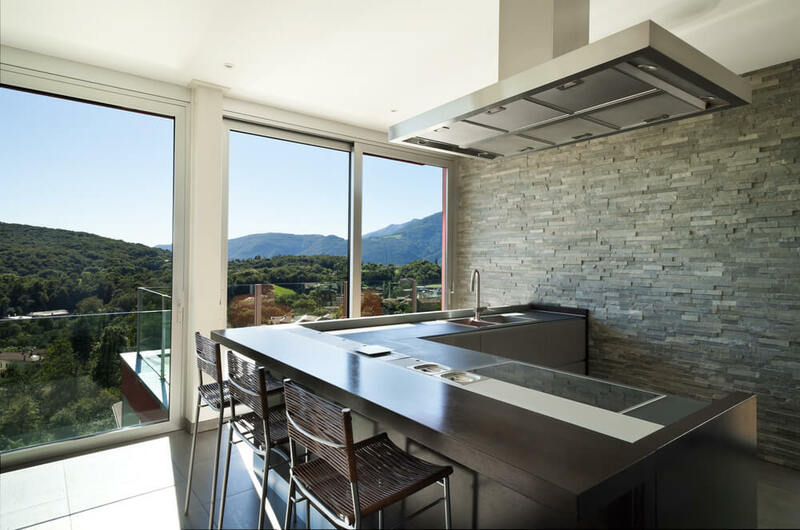 Light & Space – Modern kitchens often feature large, open windows with limited upholstery. They also make the most of any space by using materials and colors that feature high, light reflective values. 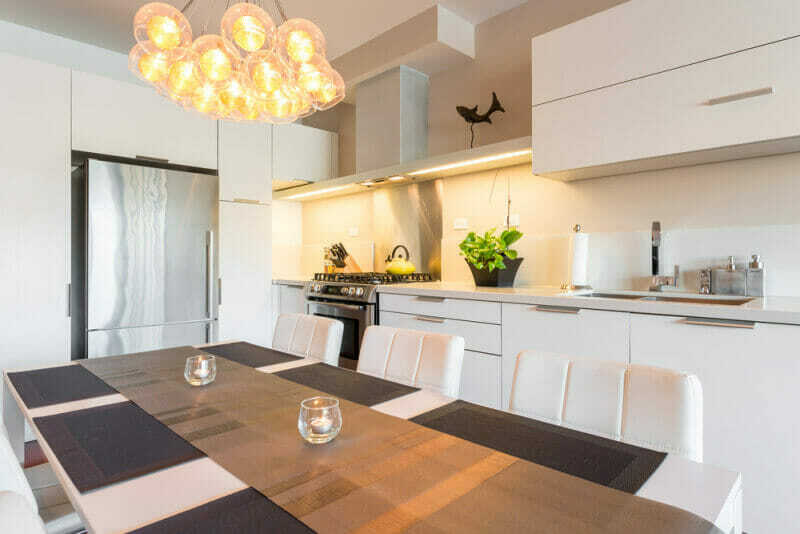 This means that most modern kitchens are light and bright, even with using darker materials. 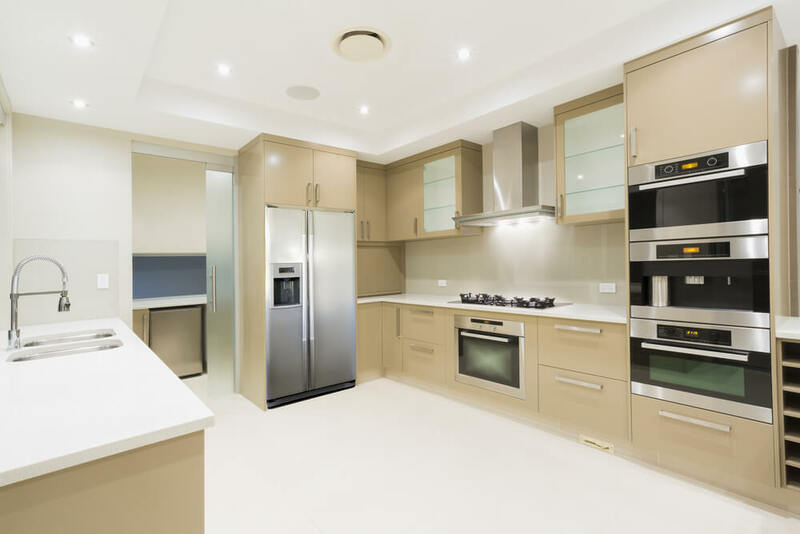 Frameless Cabinet Construction – Modern cabinetry is designed to show no, or ever little, frame. 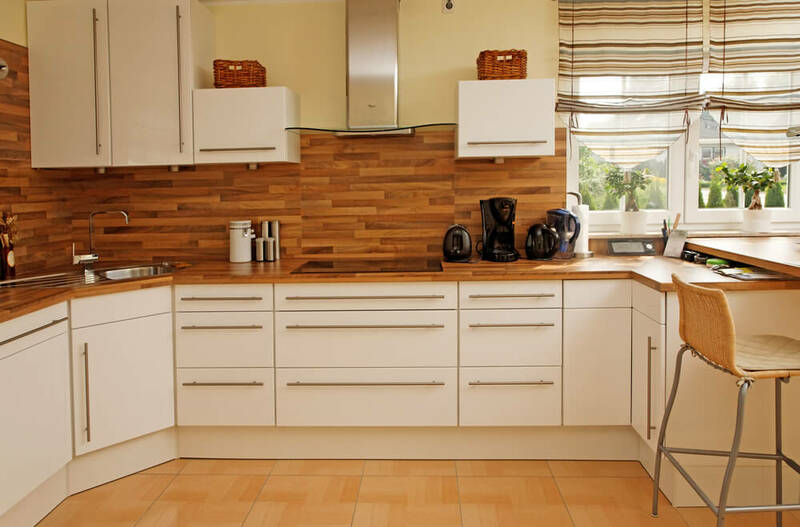 In this style the cabinet doors are arranged in a consistent, seamless fashion. This adds to the simplistic nature of modern design. 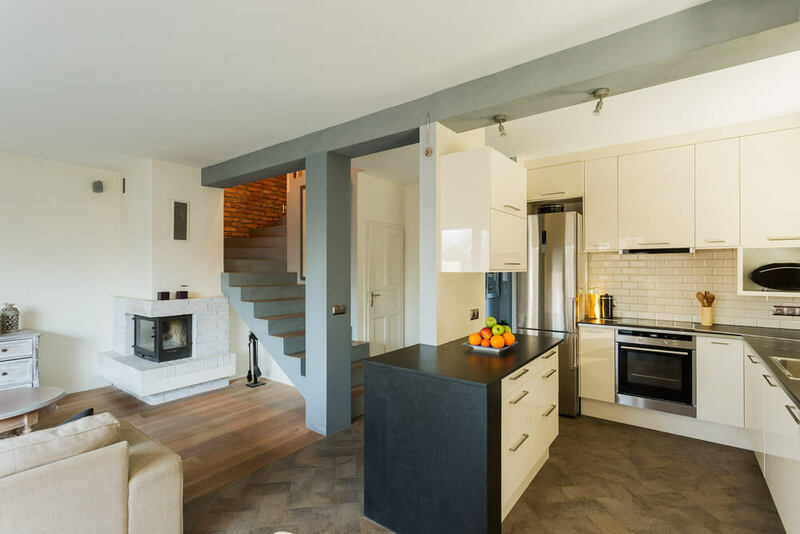 We encourage you to view the following gallery of modern kitchens to gain some inspiration for your upcoming, or current, kitchen remodeling project. 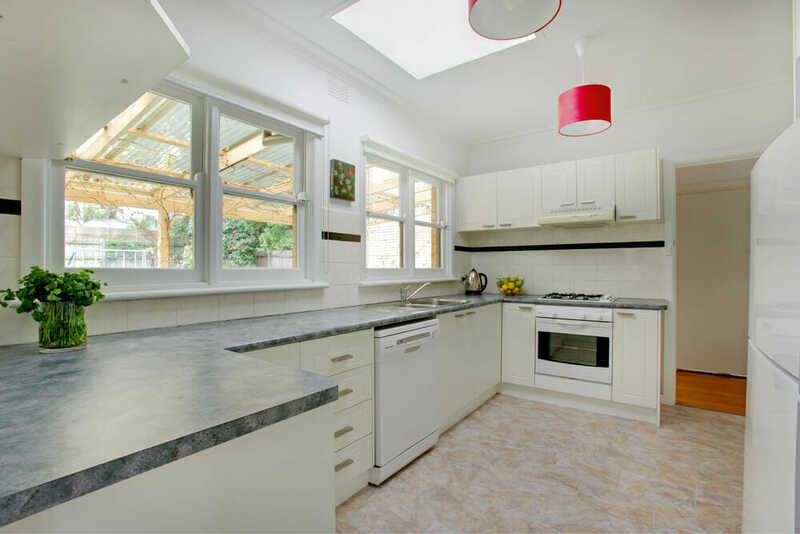 However, be sure to consult a qualified kitchen contractor when attempting to perform a full kitchen renovation. 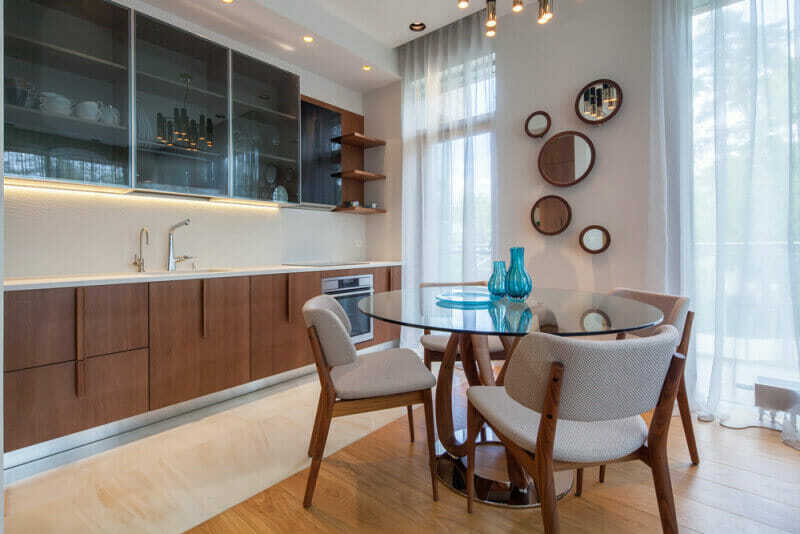 This extensive gallery contains great ideas for maximizing space and light while incorporating beautiful natural materials and sleek design. 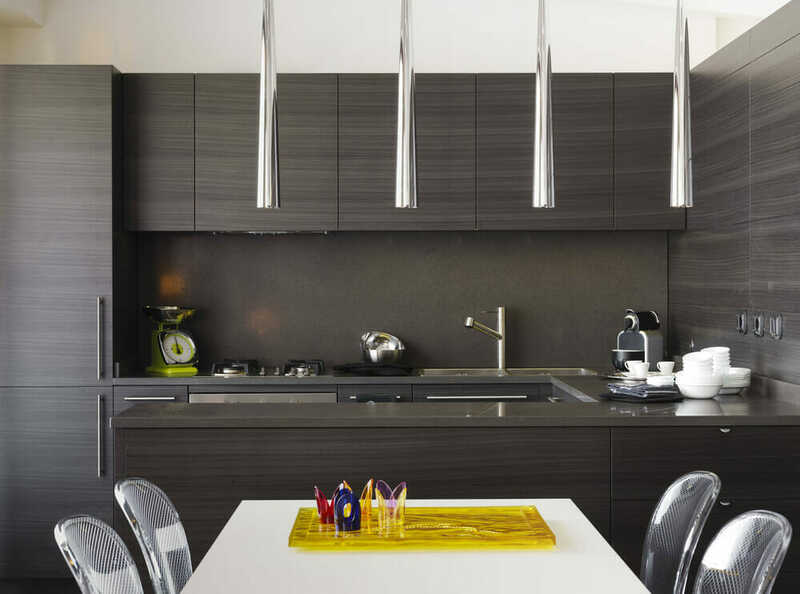 Sections of rich, cherry cabinets add warm to this sleek gray and black kitchen. 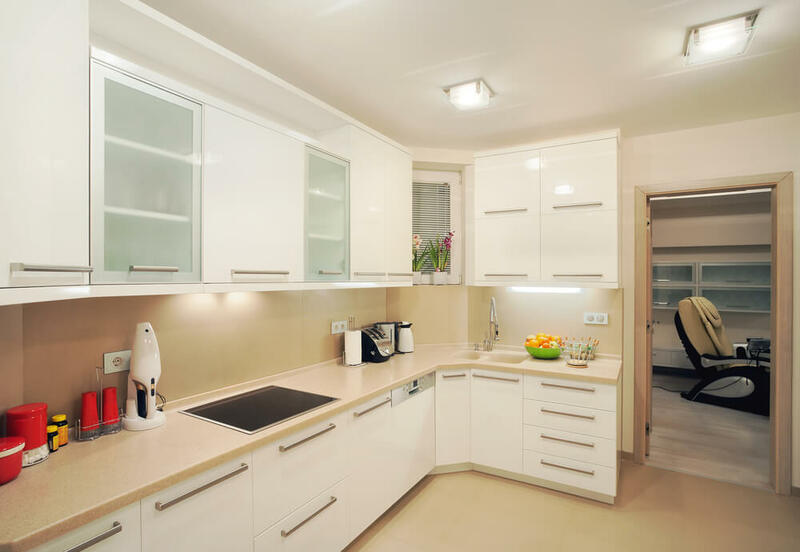 Warm, wood cabinets and solid, white cabinets work well together when they included similar features such as a flat profile and small, nickel knobs. 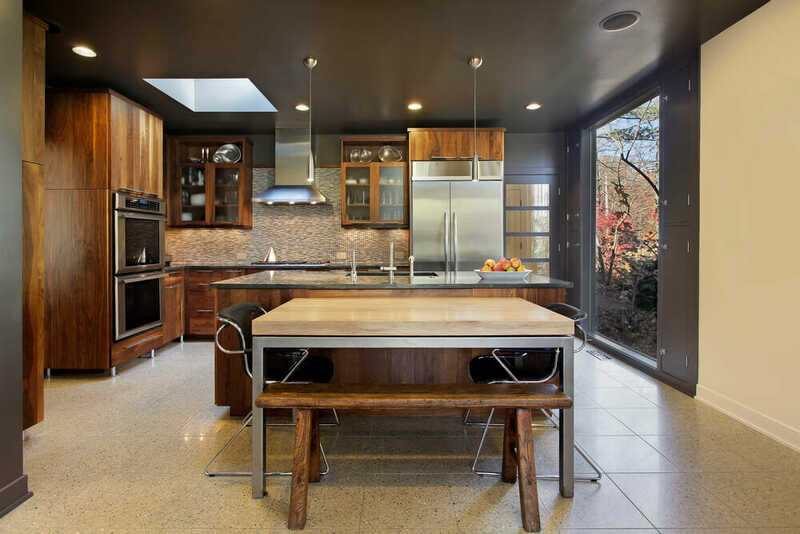 The mid-century modern design aesthetic of this linear kitchen creates a modern, yet inviting ambiance. This kitchen optimizes on storage, particularly lower cabinetry, while allowing for beautiful outdoor views and lots of natural light. 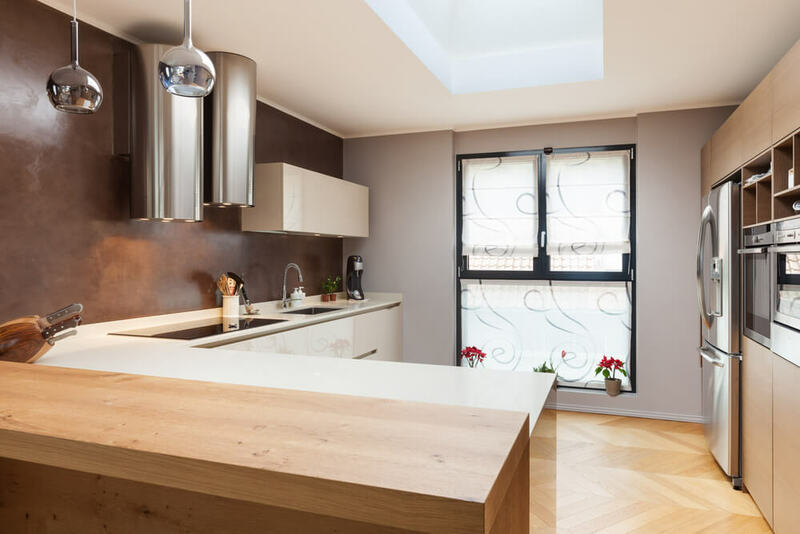 The reflective surfaces in this kitchen – cabinets and back splash – make this small kitchen space feel significantly larger. 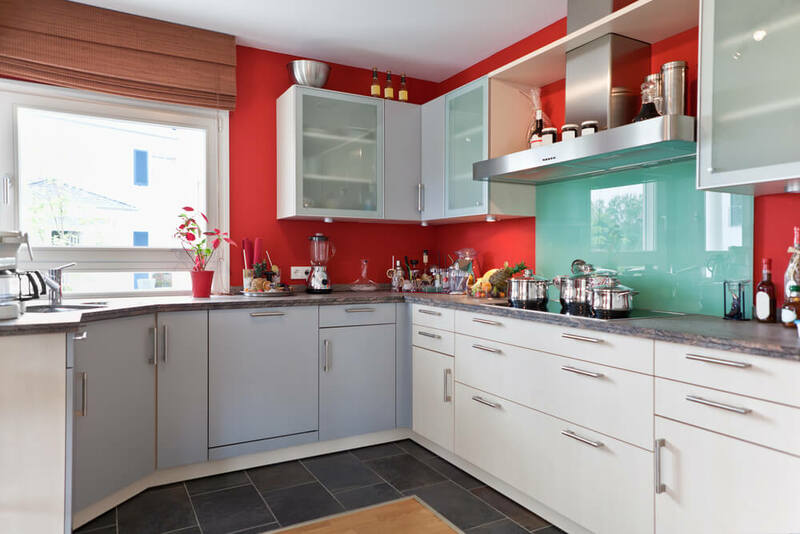 By installing a mix of open and closed upper cabinetry this kitchen allows the homeowner to discretely store items and display a few decor objects to add a splash of color. 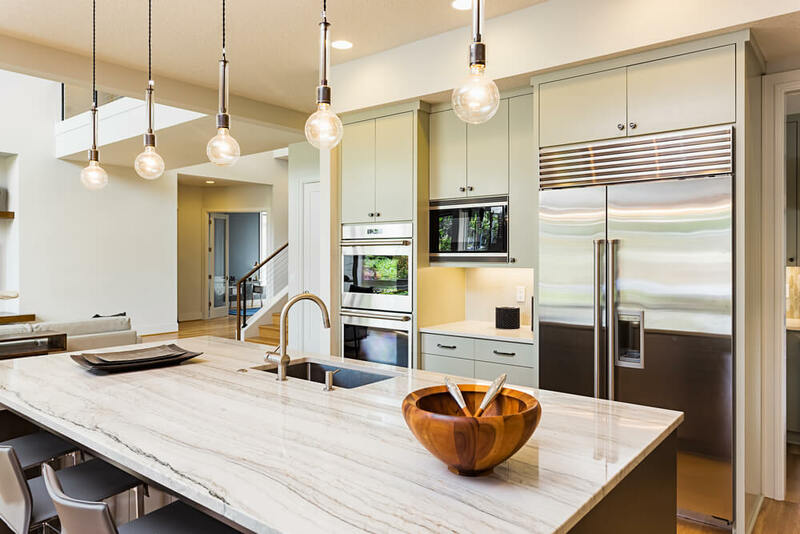 High-gloss, wood cabinetry and a creamy, stone back splash contribute to the upscale aesthetic of this efficiently-designed kitchen. 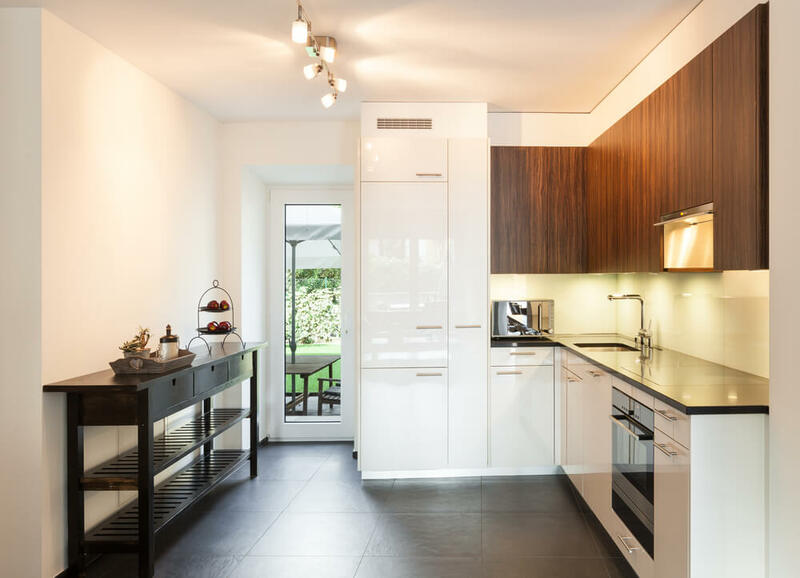 By retaining a portion of the wall separating the kitchen from the living room, this kitchen is able to offer additional storage space. 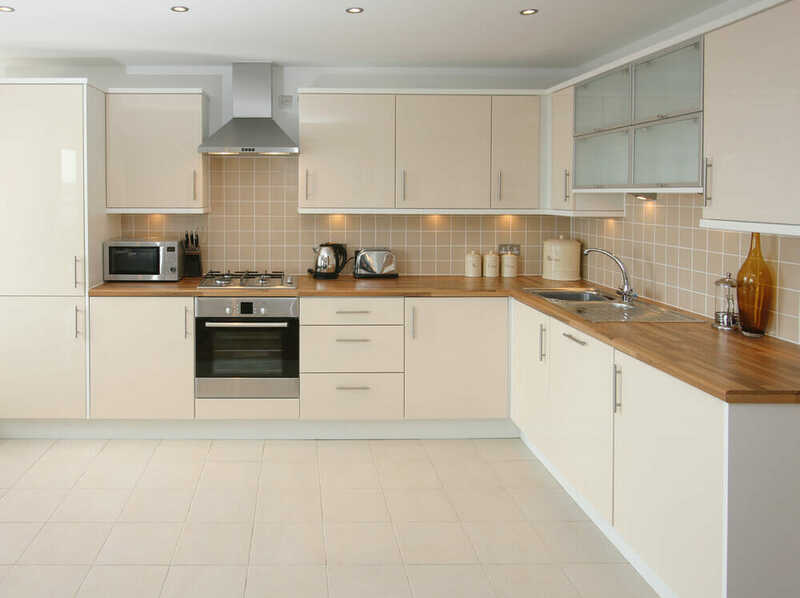 The dimensions of this polished, tan kitchen provide plenty of space for more than one cook in the kitchen. 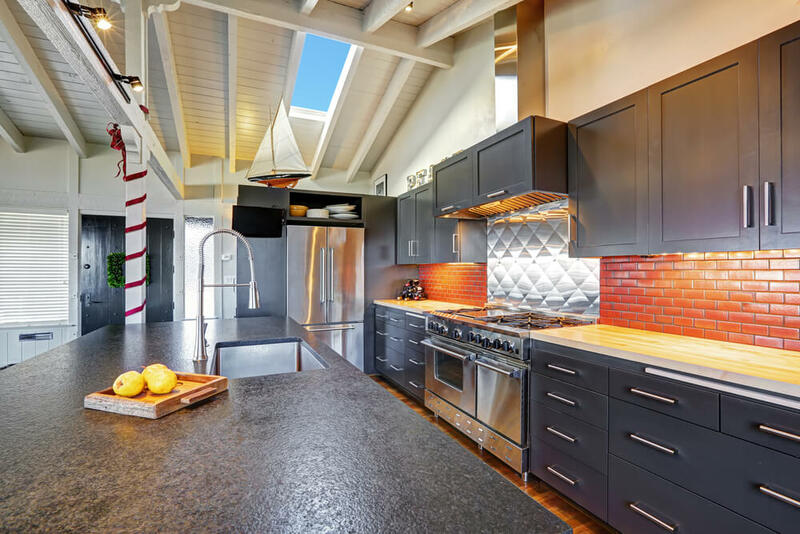 This beautiful kitchen boasts a large island, unique, cylindrical range hood and open shelving for a few simple accessories. 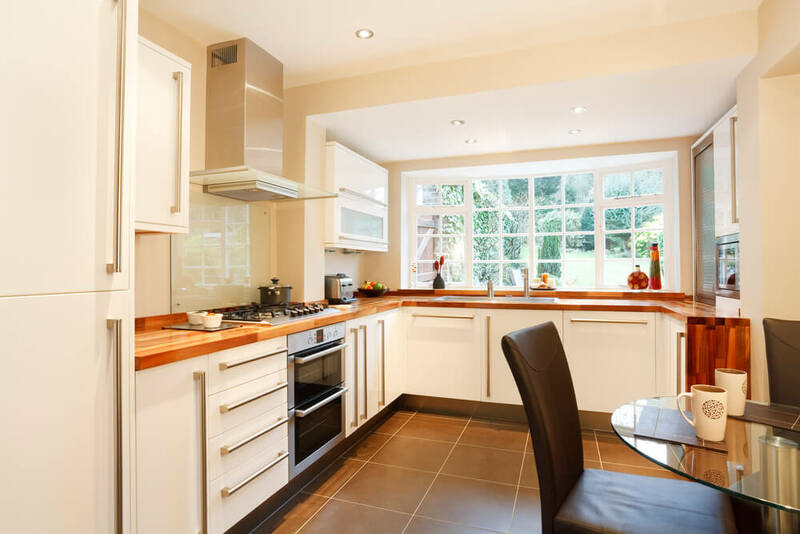 This large island and breakfast bar compensate well for the lack of counter space available elsewhere in the kitchen. Open shelving installed above a shallow, lower cabinet is the perfect place to display unique dishware or to create a coffee bar. It’s ideal, when possible, to create a space among a wall of cabinetry for the fridge. 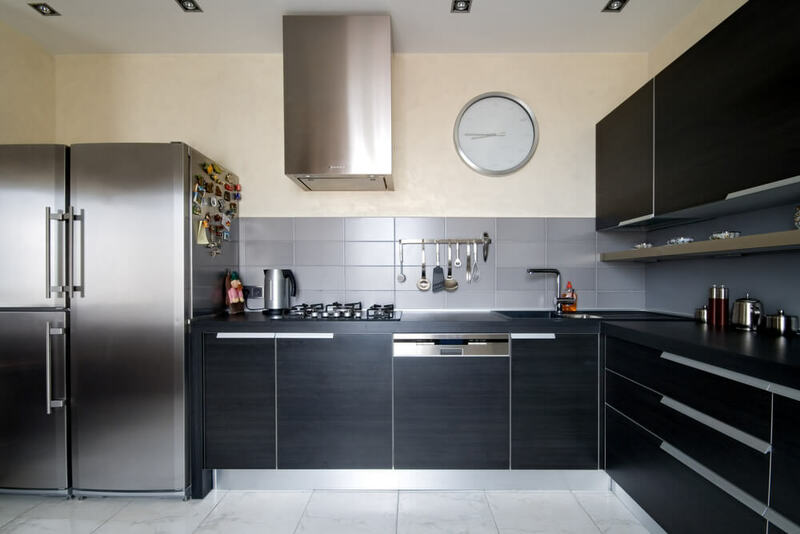 By doing this, fridge will integrate seamlessly into the kitchen space. 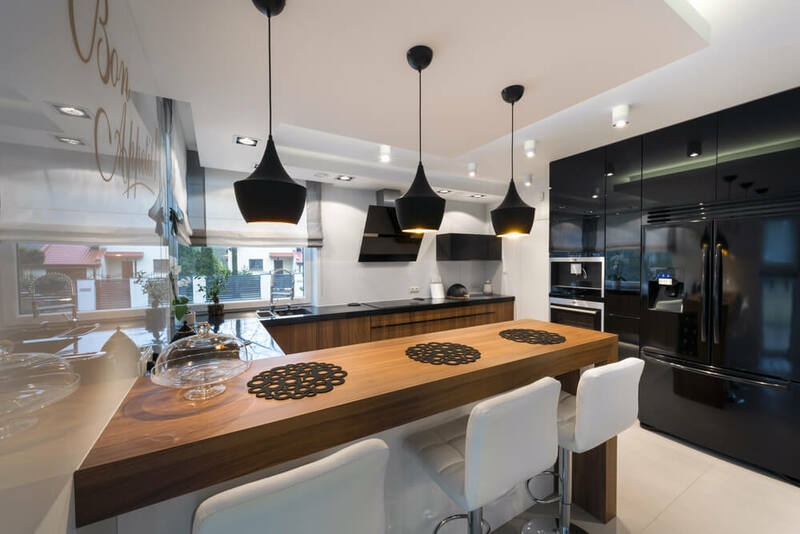 The three beautiful pendant lights shown above coordinate perfectly with the black cabinetry and counter tops in this space. 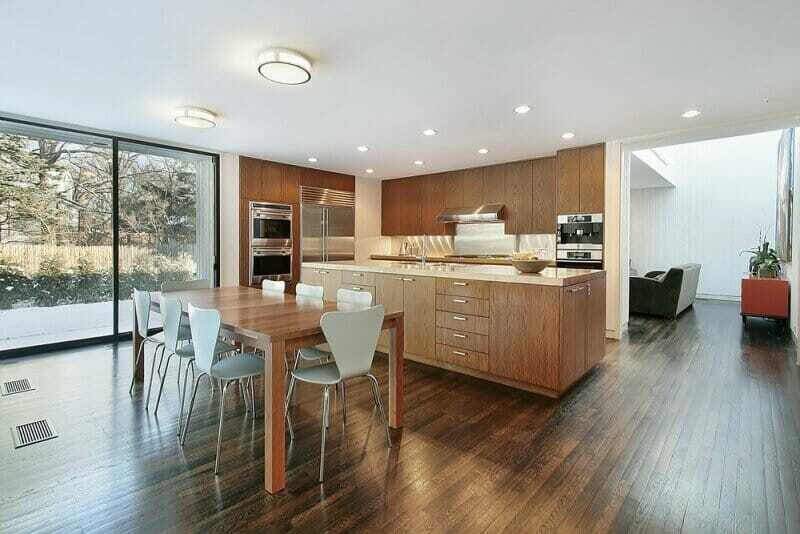 The mix of woods – cabinets, breakfast bar and flooring, soften the glossy, modern cabinetry and sparse decor. 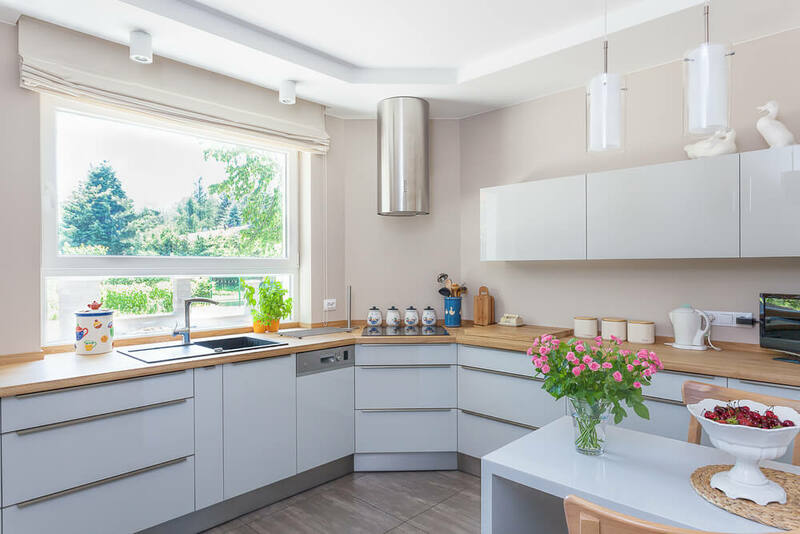 To add a unique touch to a modern kitchen, consider installing a brightly-colored faucet. This unexpected element is bound to be a conversation starter. 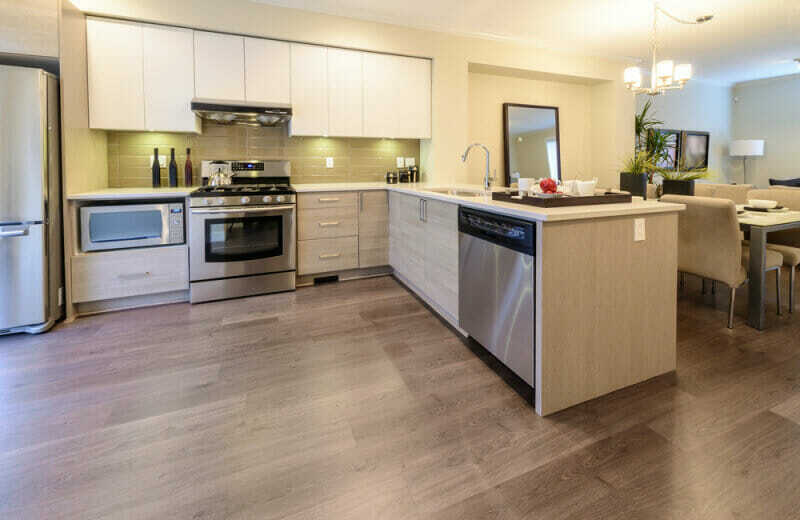 The position of this island allows for easy foot traffic in and out of the kitchen. 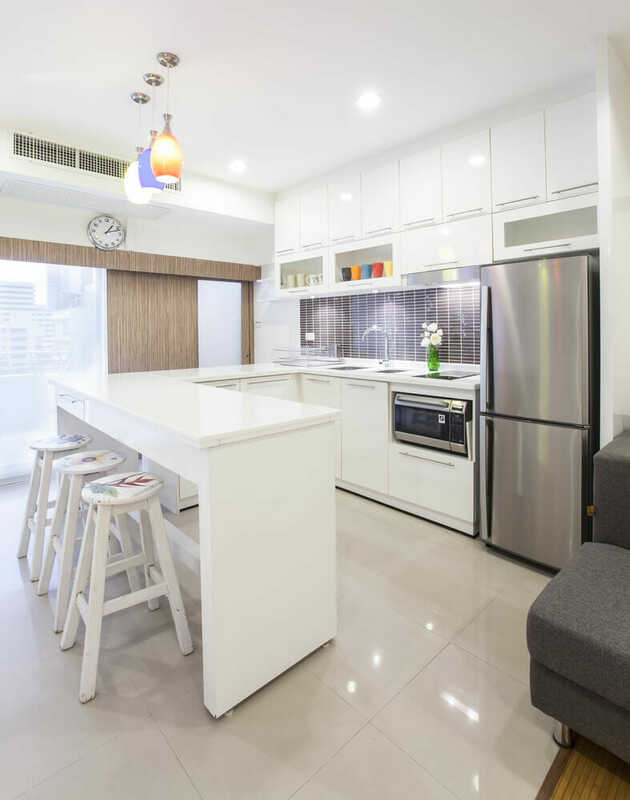 This two-level island provides a space for cooking and dining in a centralized location in the kitchen. 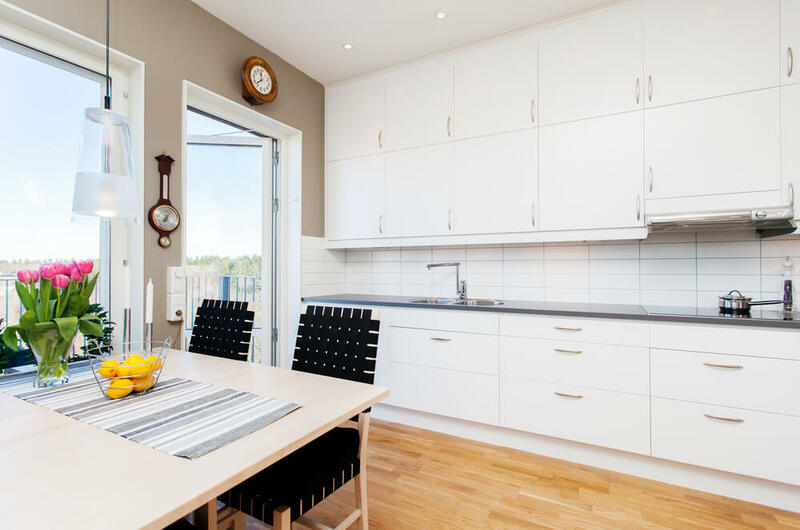 A common design style seen in modern kitchens is the combination of glossy, white and rich, wood cabinets. 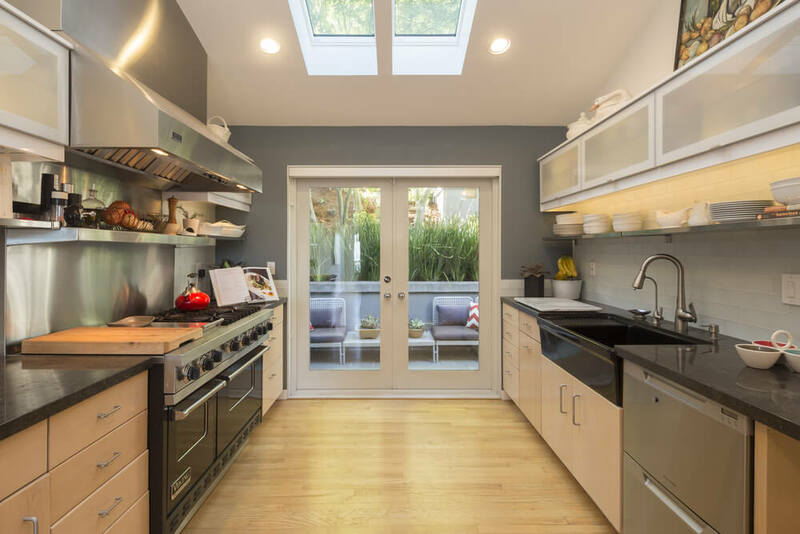 The large corner window in this kitchen provides plenty of natural light for cooking and cleaning. 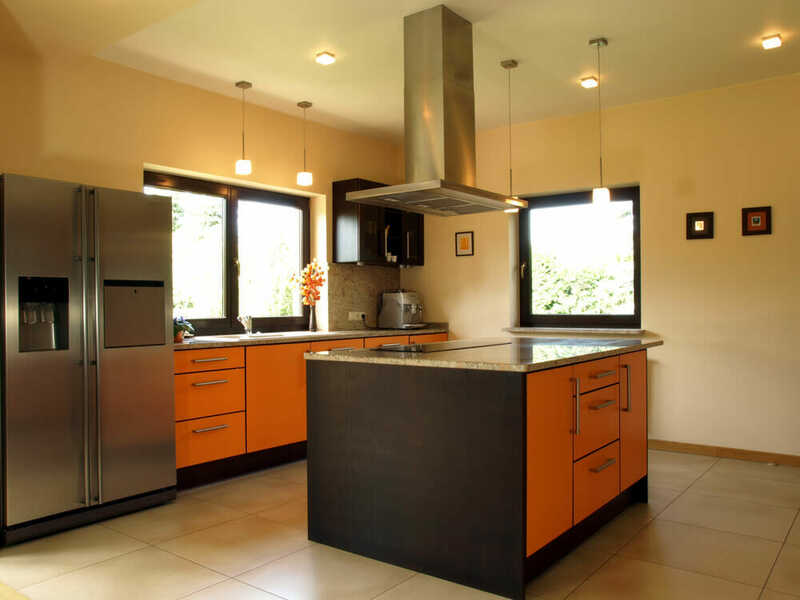 This kitchen effectively integrates many colors and textures in the cabinetry, back plash, appliances and counter top. 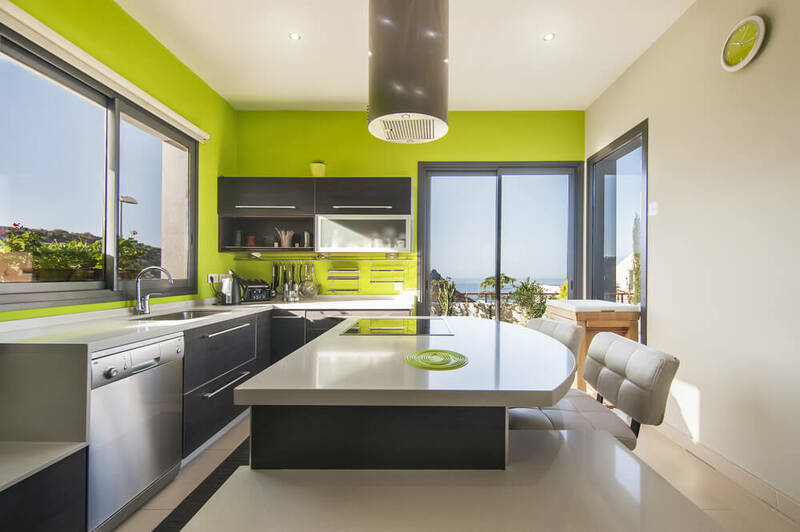 This contemporary kitchen branches out from the conventional gray, black and white color scheme by incorporating a splash of lime green. 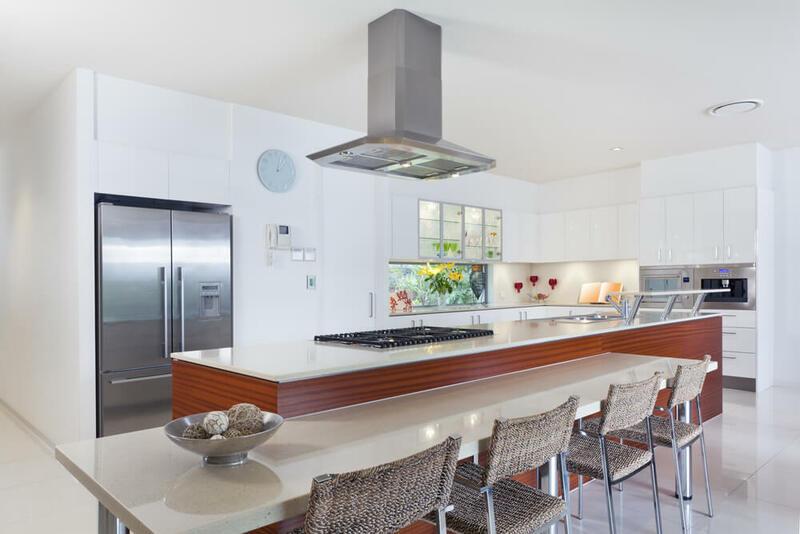 The clever design in this kitchen allows for extra shelving and a range hood above the island while still allowing light to filter throughout the space. 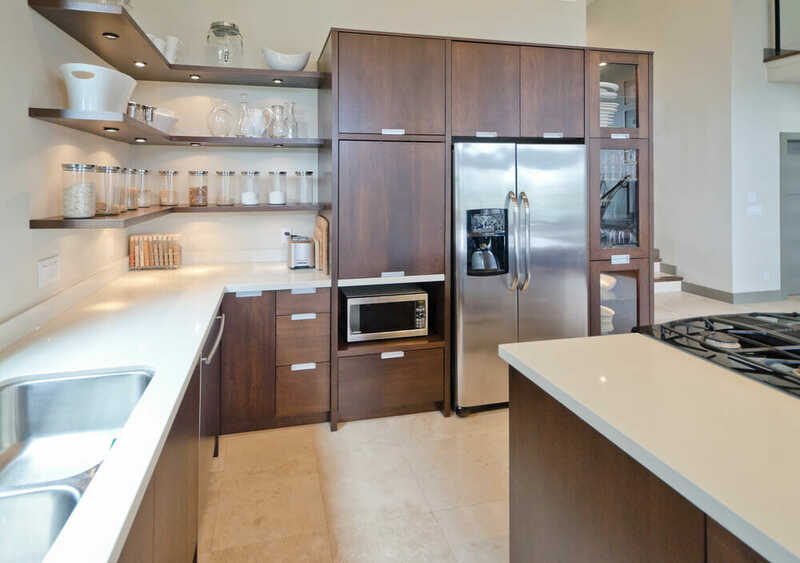 This galley kitchen optimizes on storage space by incorporating an entire wall of cabinetry and built-in appliances. 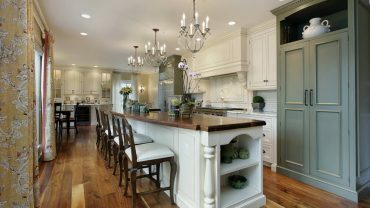 In a kitchen with limited width, a long narrow island can work effectively to allow for extra seating and counterspace for prep work. 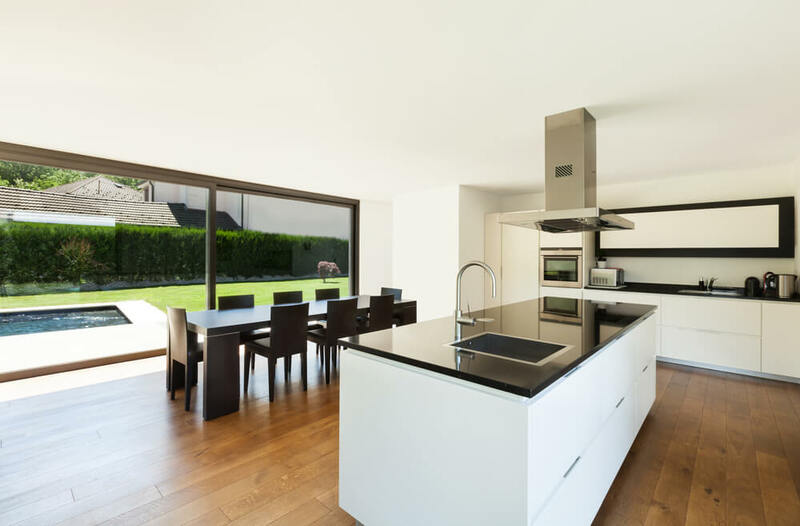 While not often seen, this modern kitchen is installed in the middle of a large, open-concept space and features low cabinetry so as to not completely isolate it from the rest of the space. The stacked, tile back splash provides a modern twist on the typical, staggered tile installation pattern. If space allows, consider including a free-standing, shelving unit to display kitchen accessories and provide an area to serve food. 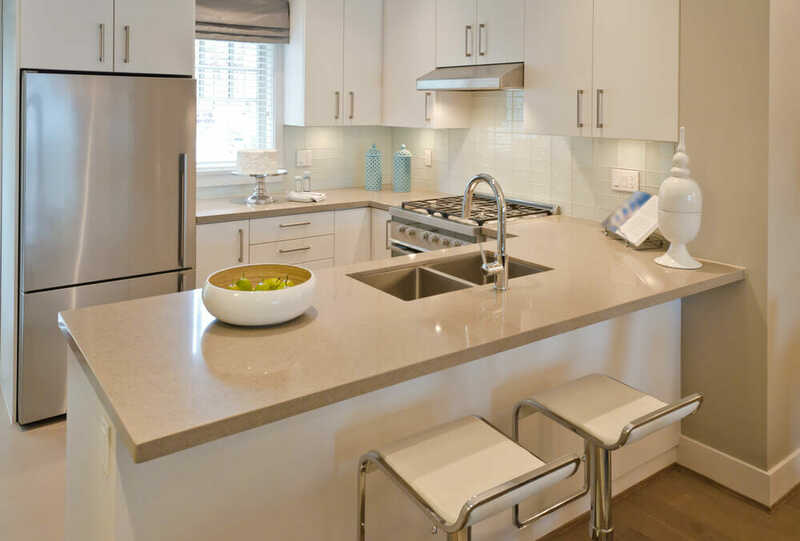 The mint-green glass back splash, cream-colored counter tops and gray wood cabinetry complement each other perfectly. 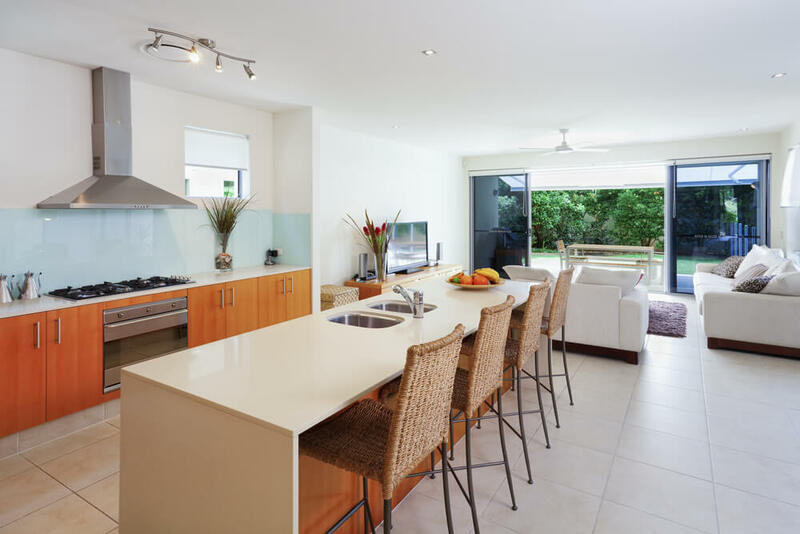 The layout of this chef’s kitchen directs your eye straight to a relaxing, outdoor space. 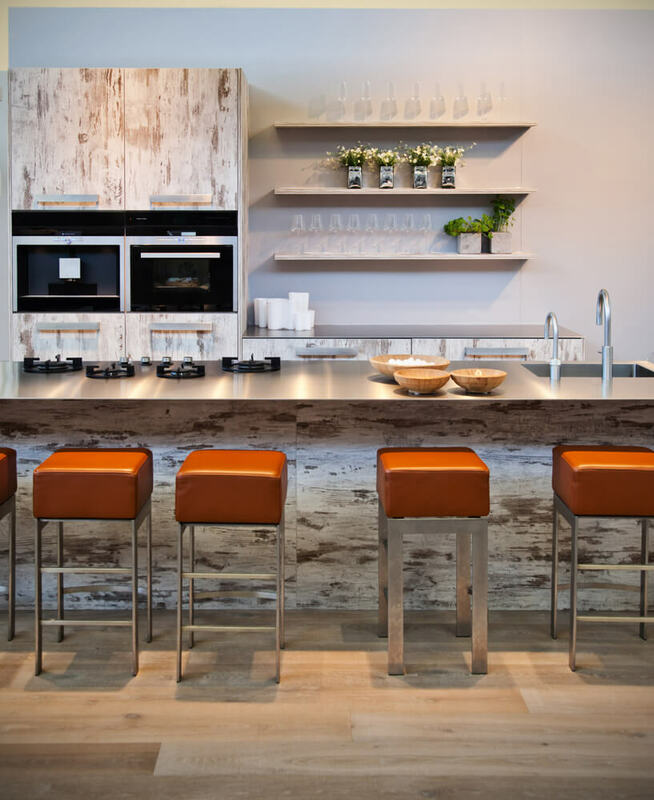 The row of stainless steel cabinetry add an industrial aesthetic to this modern space. This modern country kitchen combines polished, white cabinetry and worn, wood flooring for the perfect balance of rustic and modern. 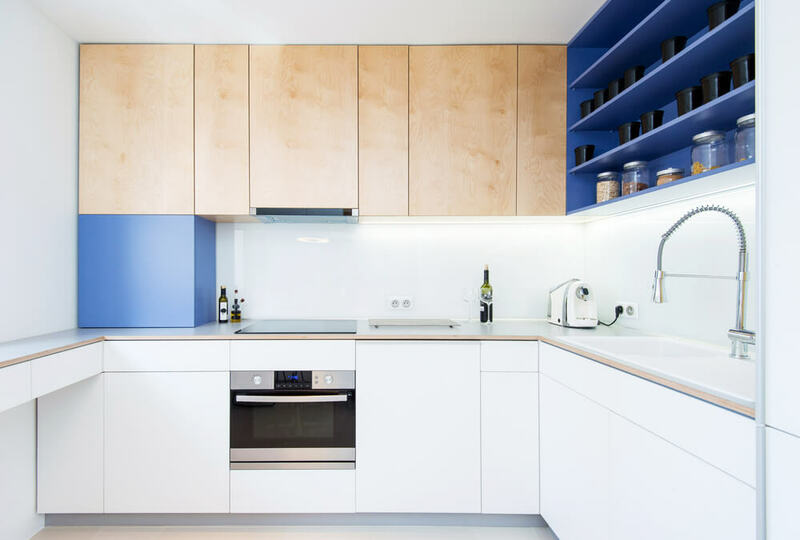 A pop of electric blue adds depth to this seamless, white kitchen space. 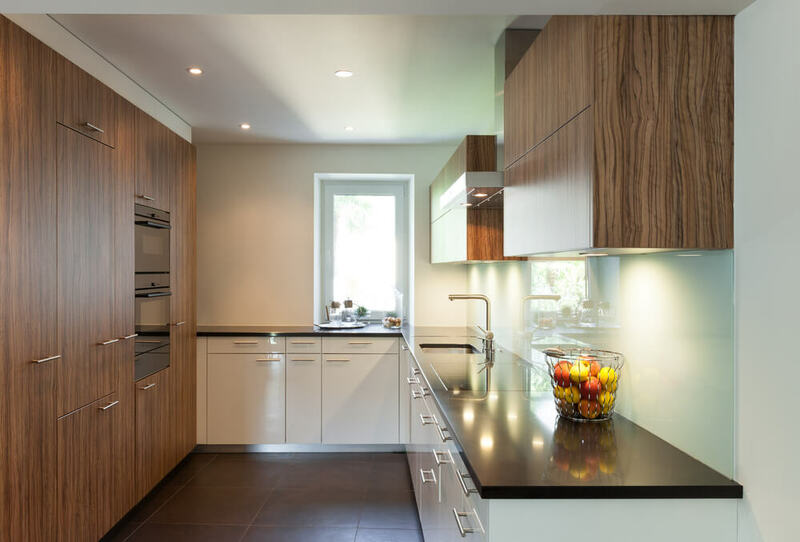 Opting for all or no upper cabinetry is an excellent way to reduce the visual weight of a kitchen and create a modern feel. 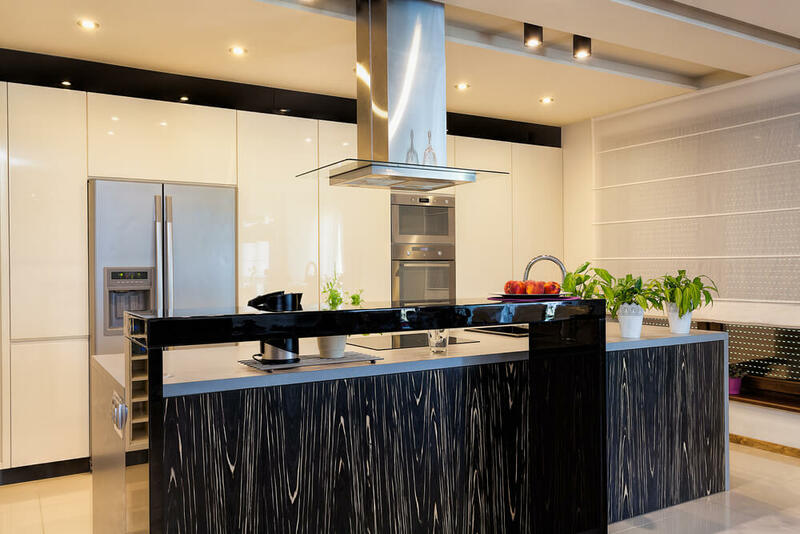 This black, wood grain island is creates an impressive focal point for this lustrous, white kitchen. 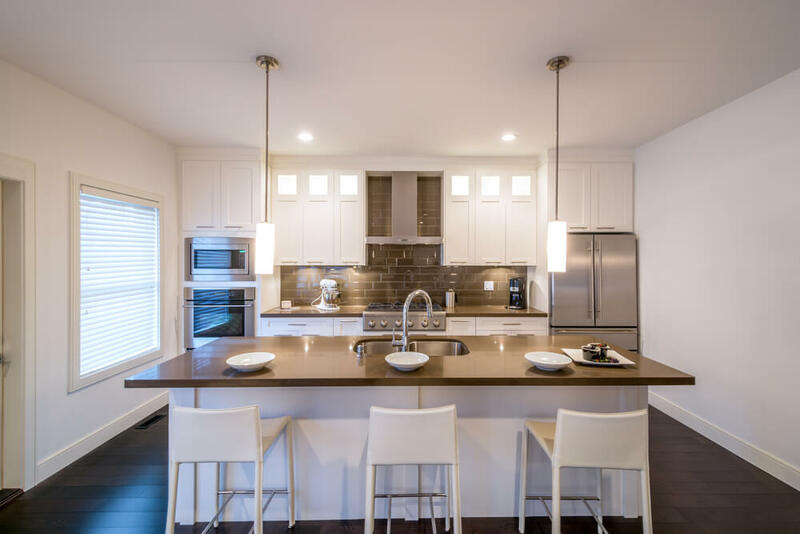 This kitchen incorporates the design “Rule of 3” by including sections of 3 white and 3 wood upper cabinets, as well as 3 pendants lights and 3 flush mount fixtures. 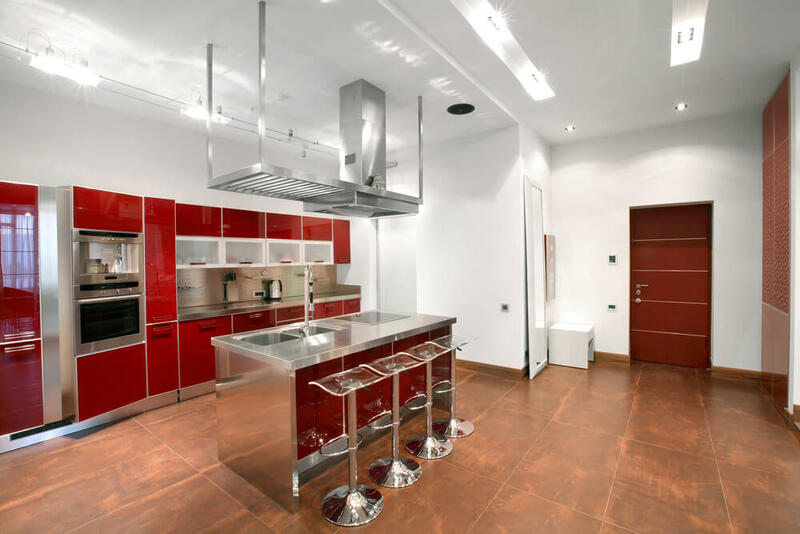 The raspberry-red paint color in this kitchen is an interesting and unexpected touch. By varying the counter top height, this kitchen design provides room for a small window to introduce more natural light. 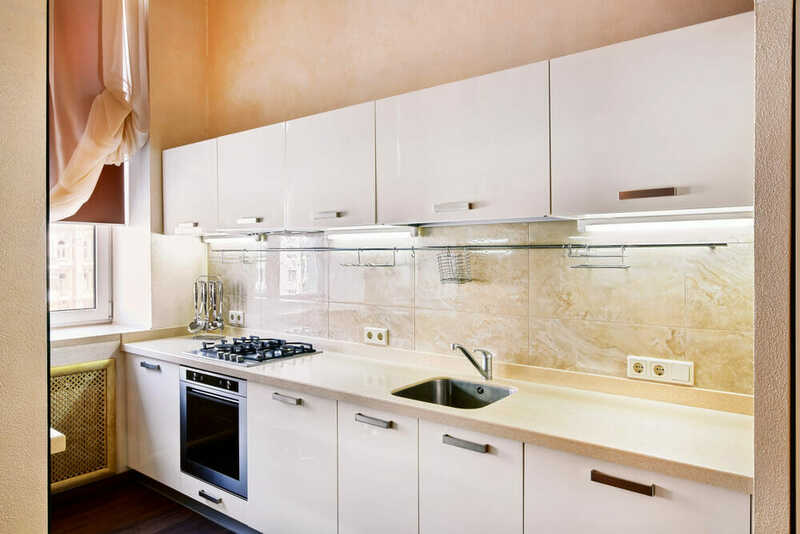 This kitchen’s wall of mirror acts as a back splash while creating the illusion of a larger space. Large, wood plank flooring softens the crisp, white line of cabinetry in this beautiful, expansive kitchen and dining area. 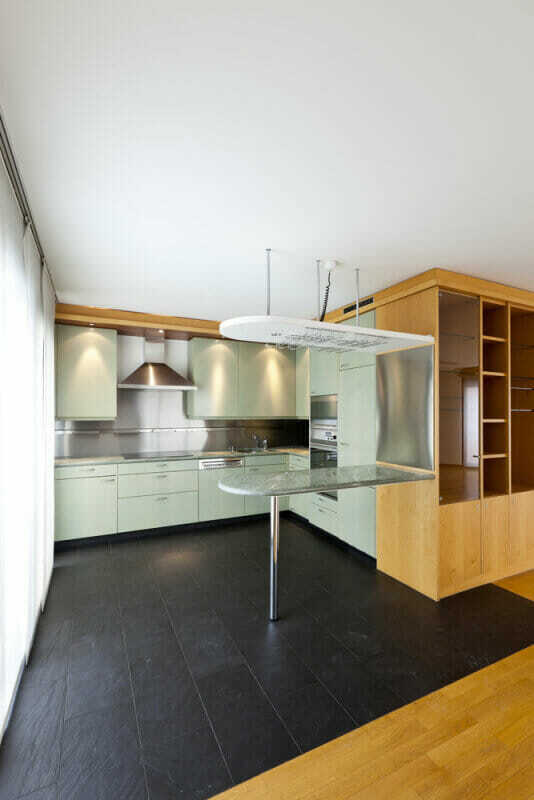 The installation of a cooktop and cylindrical rangehood effectively utilizes the angled wall in this space. By installing a low, horizontal window underneath a row of cabinetry, this space allows for maximum light and storage space. 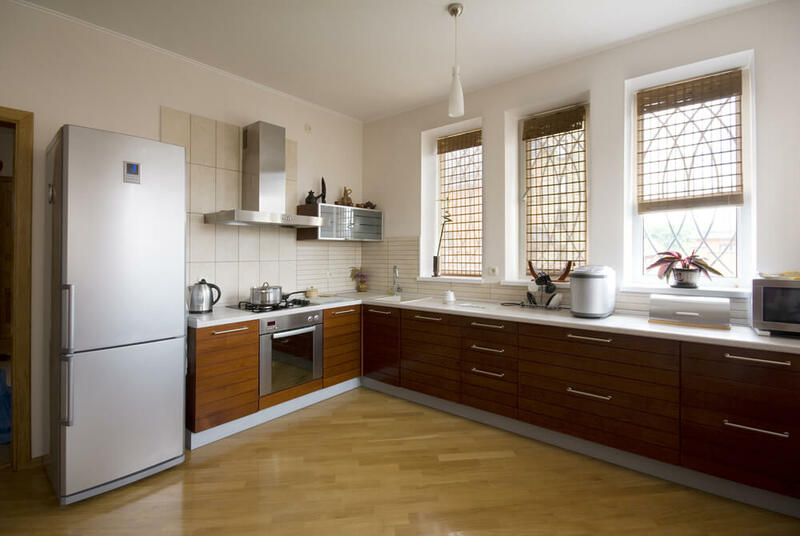 Additional counter space is made available when a dedicated area is created for the oft-used microwave. Limited the number of small appliances to display when counter space is limited. 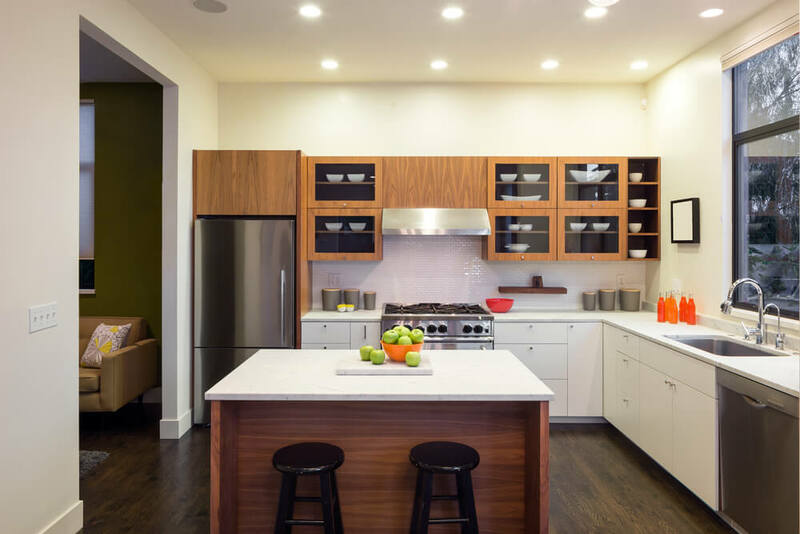 The creamy back splash and soft-orange wall color add warmth to the contemporary, white cabinetry in this space. 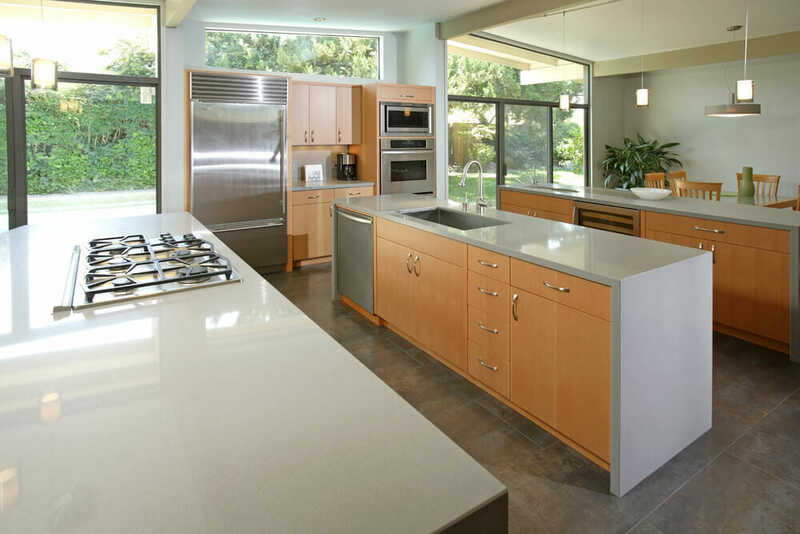 A butcher block counter top is a cost-effective alternative to marble or quartz surfaces. 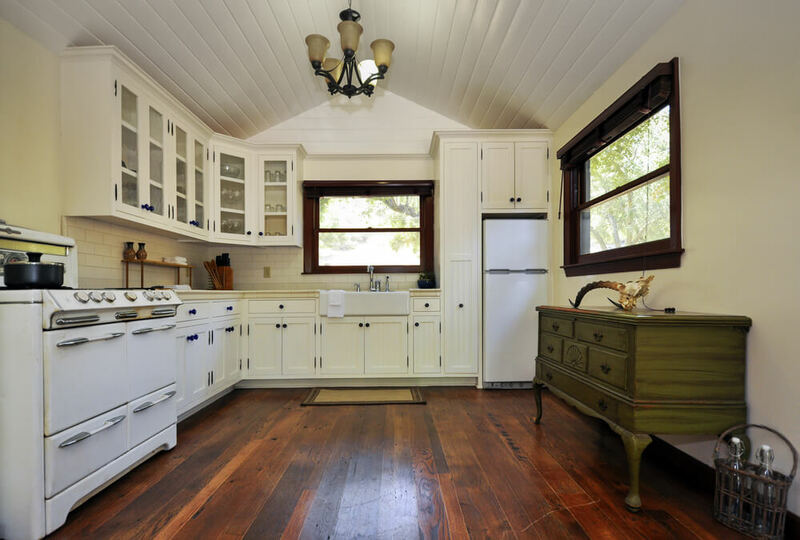 This cottage kitchen utilizes the ceiling height by installing a double row of upper cabinetry, rather than a single row. For a family kitchen, consider painting of section of your island with chalkboard paint to provide a place for your children to develop their drawing skills. Washing dishes is made much more enjoyable by installing the kitchen sink to face the remainder of the home. 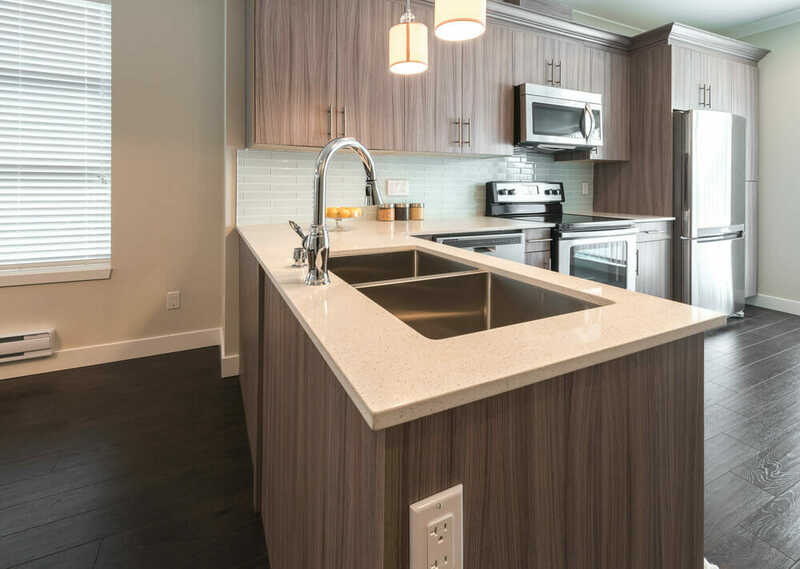 This long, narrow island features a wooden, wrap-around counter top and integrated stainless steel storage. 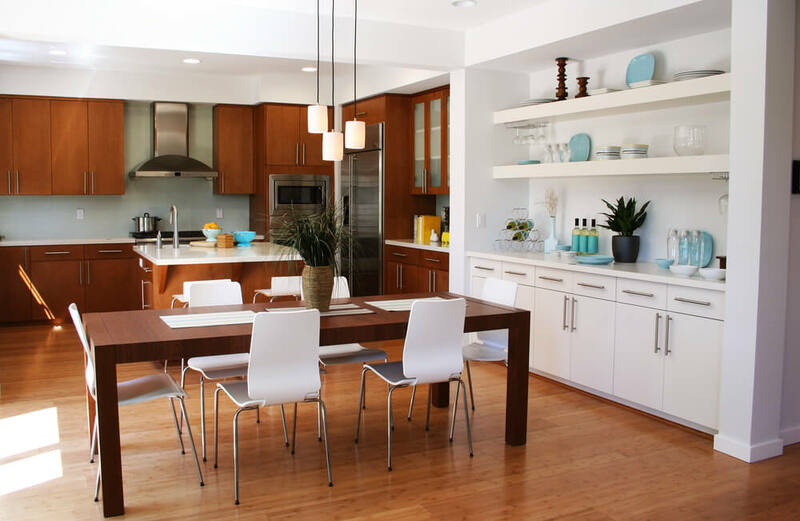 The light blue back splash and woven bar stools provide a sand-and-surf design flavor to this modern kitchen. A large, stone feature wall creates an impressive focal point for this lofty kitchen space. 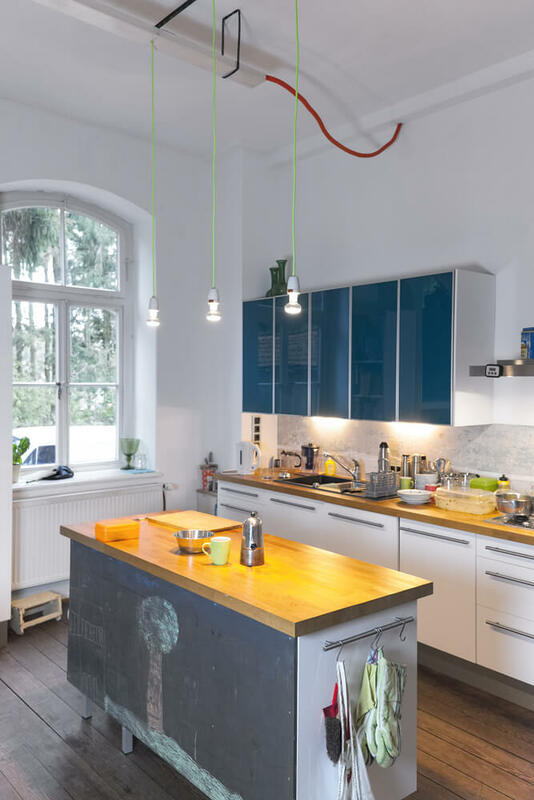 A row of brightly-colored mugs and vibrant pendant lights add a playful touch to this small, open-concept kitchen. 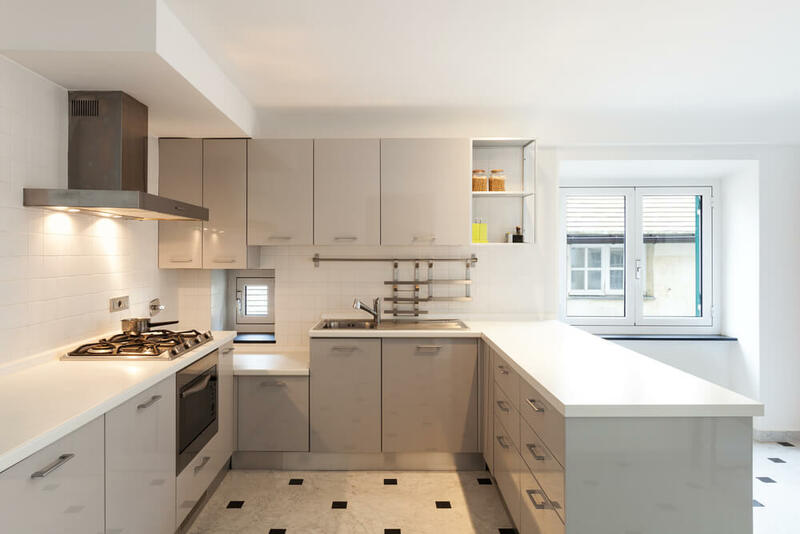 This kitchen follows the standard, modern design rule of white-on-white, to create a simple, elegant space. 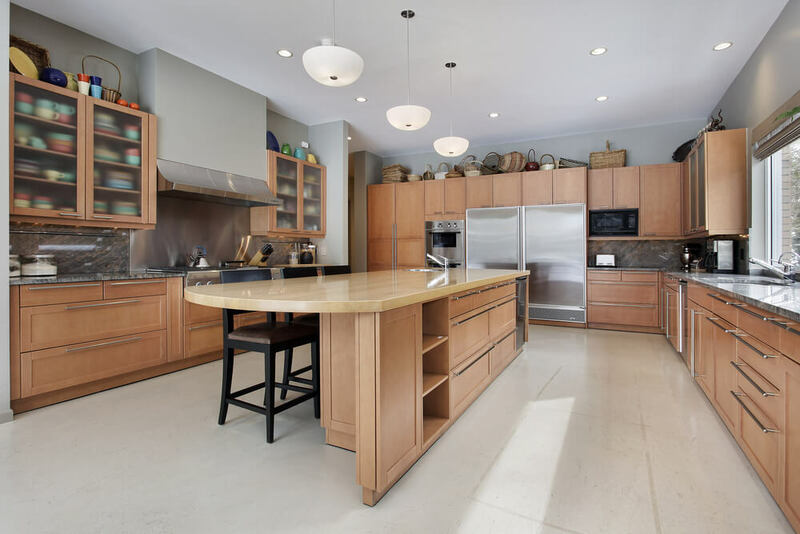 Everyone is sure to love this kitchen with its expansive island and additional breakfast bar. 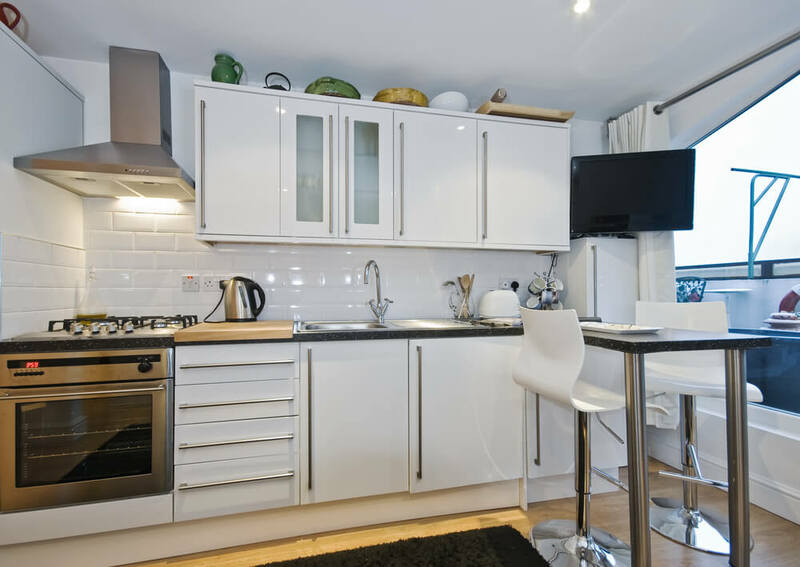 It provides plenty of room for cooking and entertaining. 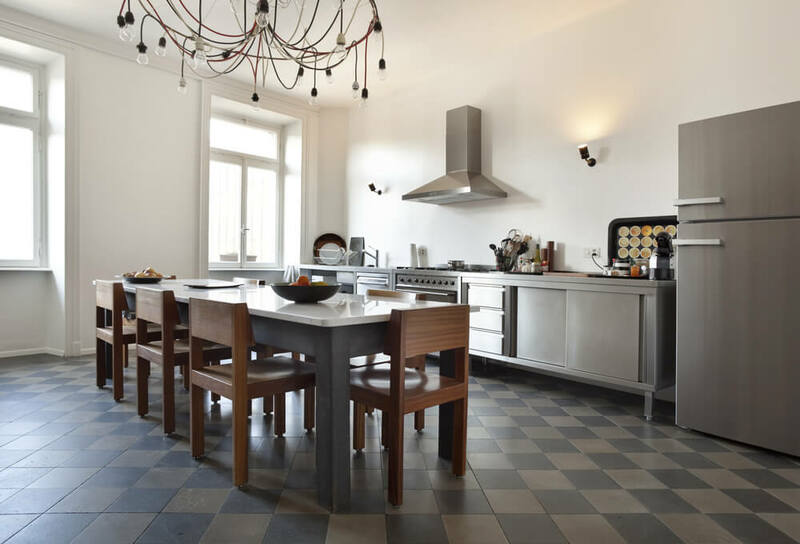 Large, neutral-colored tiles make this kitchen feel much larger than it is. 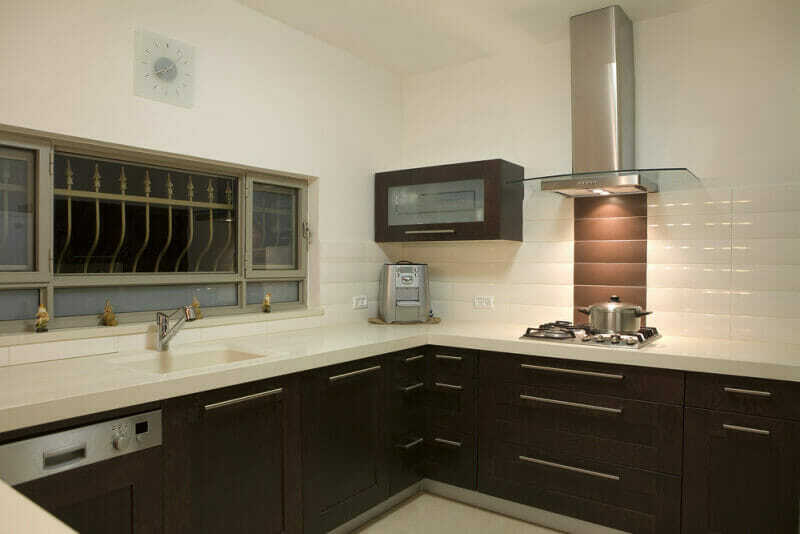 The glossy counter top and back splash provide an ideal backdrop for the display of kitchen accessories. 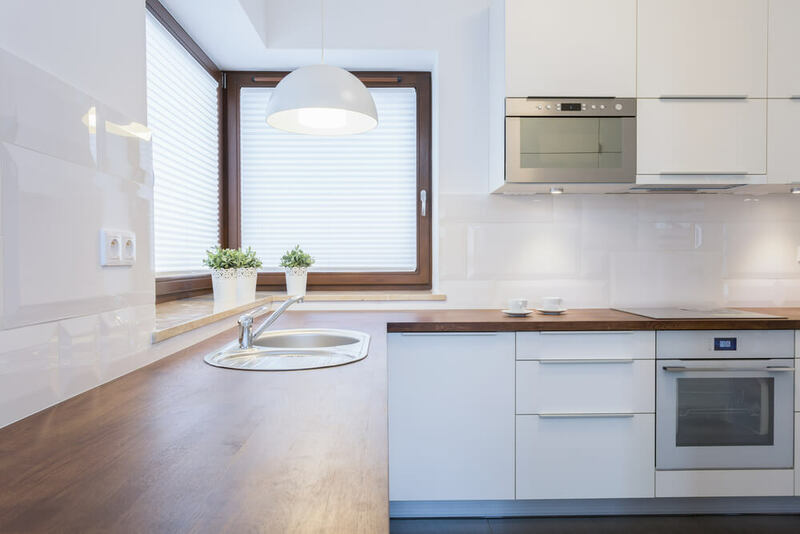 When a natural lighting source is not available, consider installing under-cabinet lighting to brighten the dark kitchen corners. The dark, slate tiles in this kitchen anchor the eye and contrast nicely against the light-green cabinetry. This kitchen features a unique design feature by spacing white cabinets among the majority of dark wood cabinets. The unique wall treatment in this kitchen accents the modern appliances and cabinetry of the kitchen. 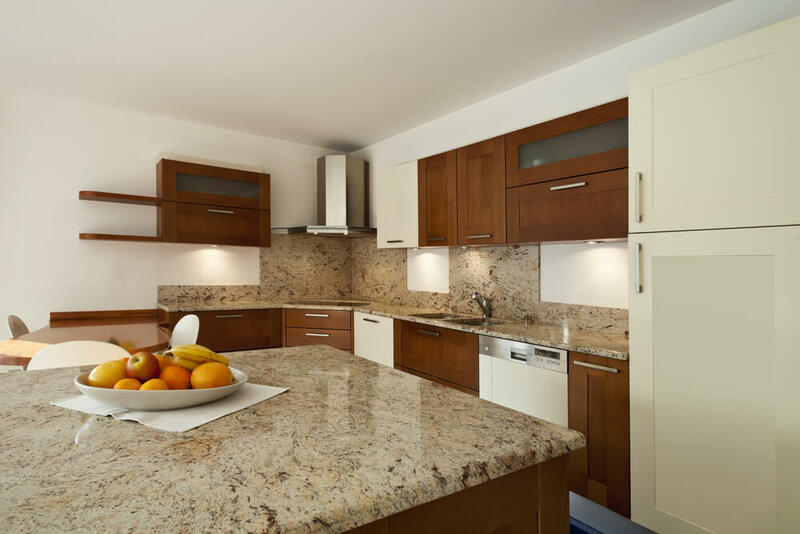 Lack of upper cabinetry provides an opportunity to include an elegant, stone back splash and simple, glass shelving. 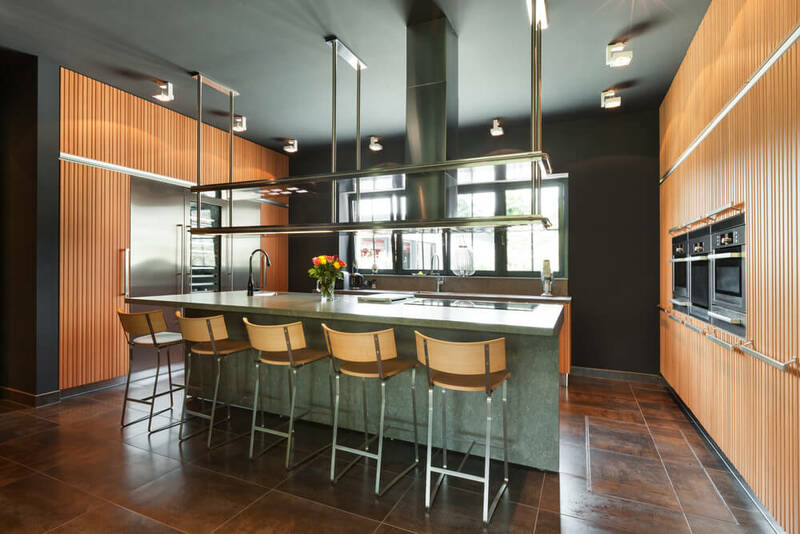 The dark cabinetry and stainless steel accents of this kitchen create a masculine design aesthetic. 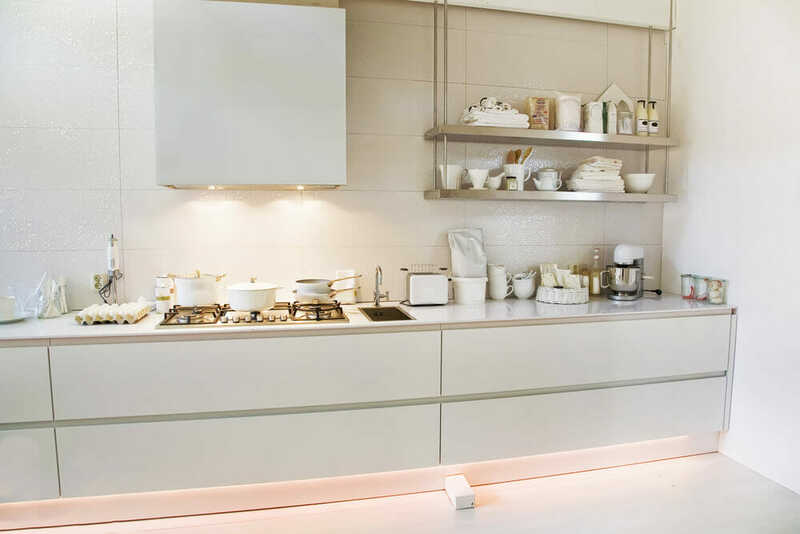 This kitchen’s creamy color palette provides a softer feel to the typical, all-white, modern kitchen. 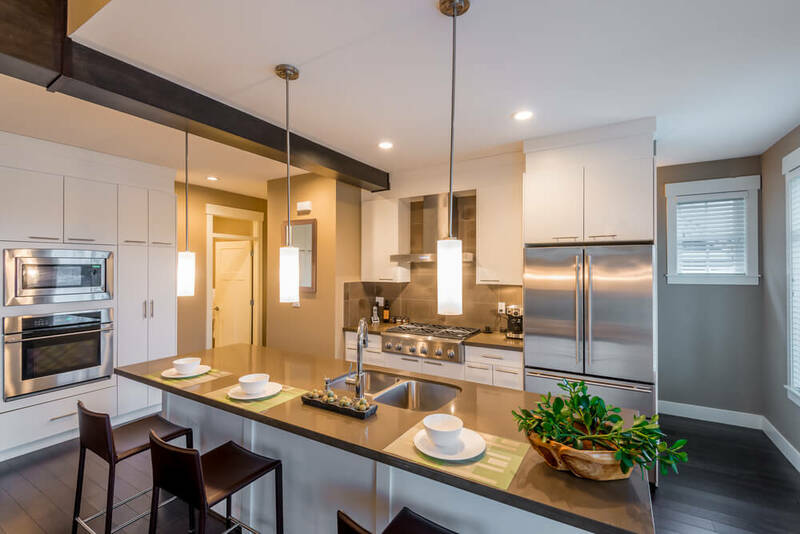 The large, industrial chandelier coordinates well with the stainless steel cabinetry in this eclectic, modern kitchen. 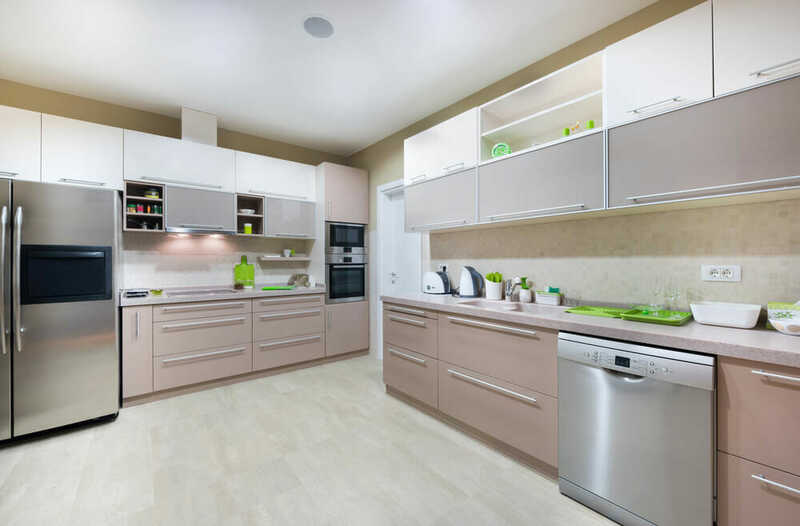 There shouldn’t be much need to display small kitchen appliances in this kitchen due to the extensive amount of storage space. 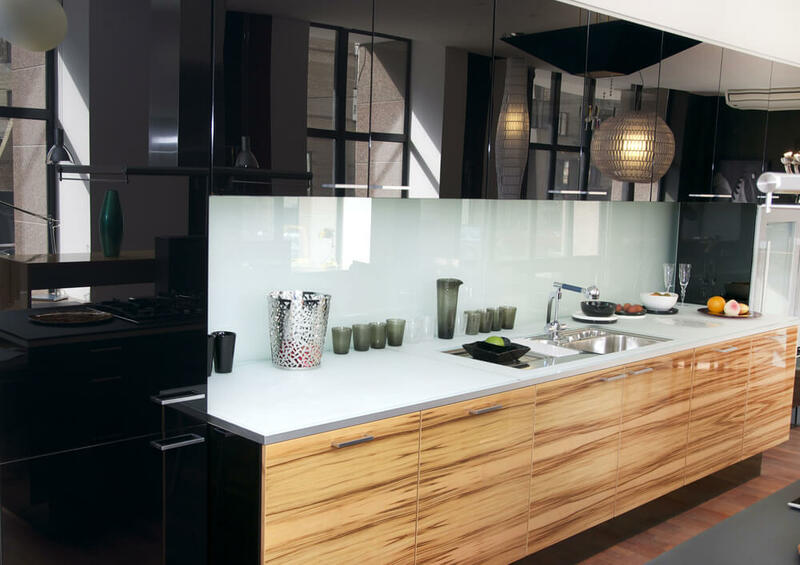 To break up an expanse of wood cabinetry, consider installing a few glass-front upper cabinets. Lighting does not always have to be conventional. 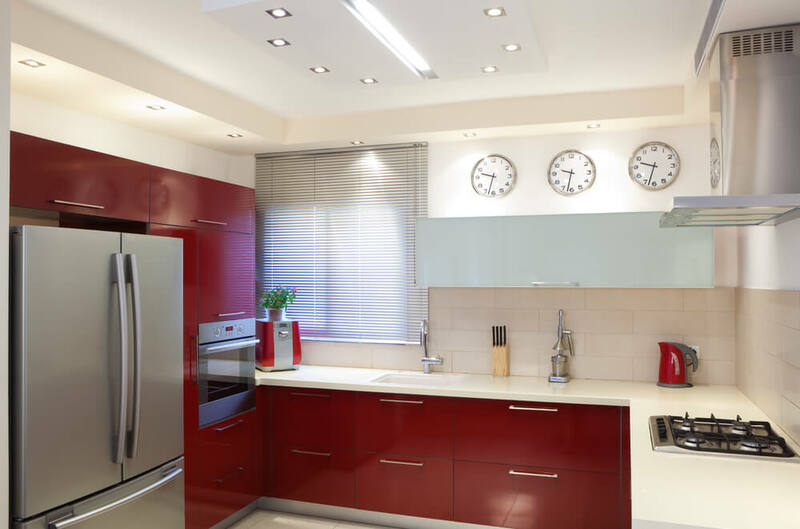 This red, pendant lights in this kitchen add a unique touch to the space. The splash of green above the range plays well with the view available from adjacent windows. 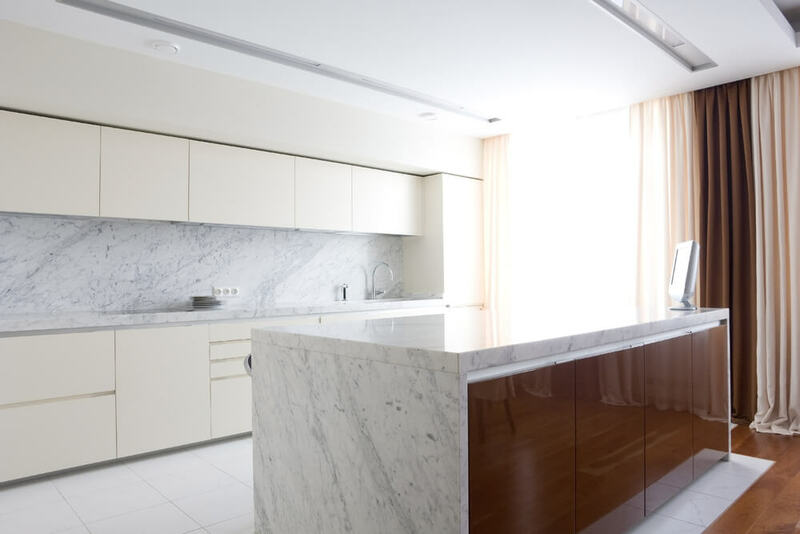 An island wrapped in marble creates a statement without requiring additional ornamentation. 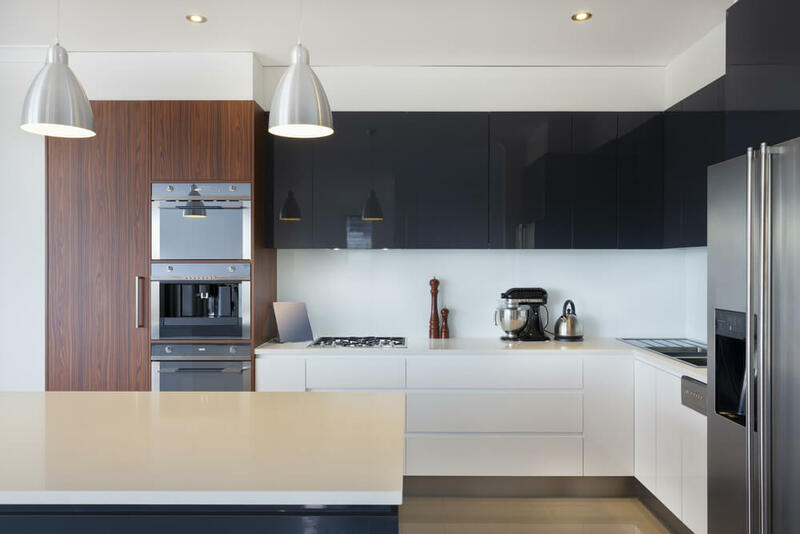 The glossy application on these black cabinets ensures that the space doesn’t feel oppressive by allowing for optimal light reflection. 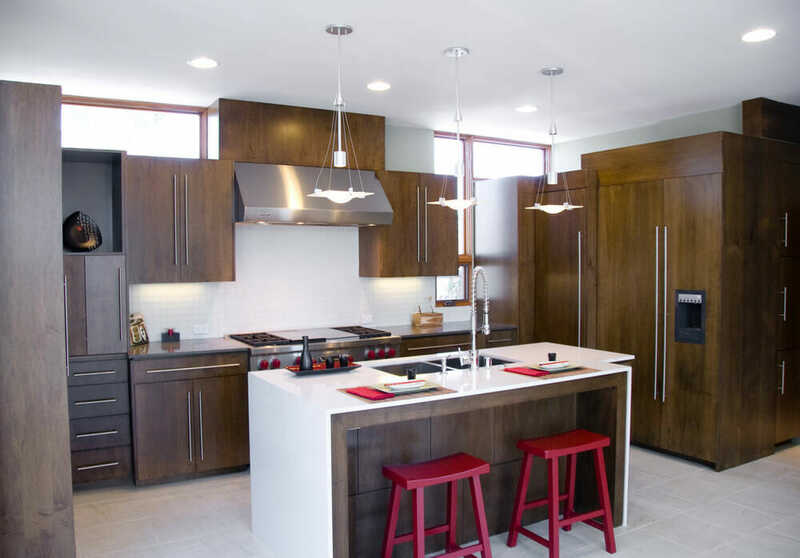 Classic red receives a modern update when applied to flat-paneled cabinets doors. 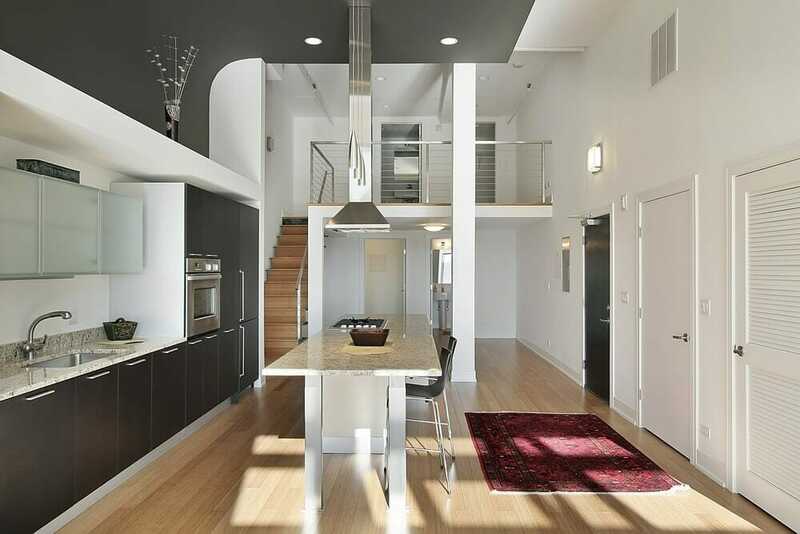 Just as in fashion, black and white are a classic color palette that provides a timeless feel to any space. 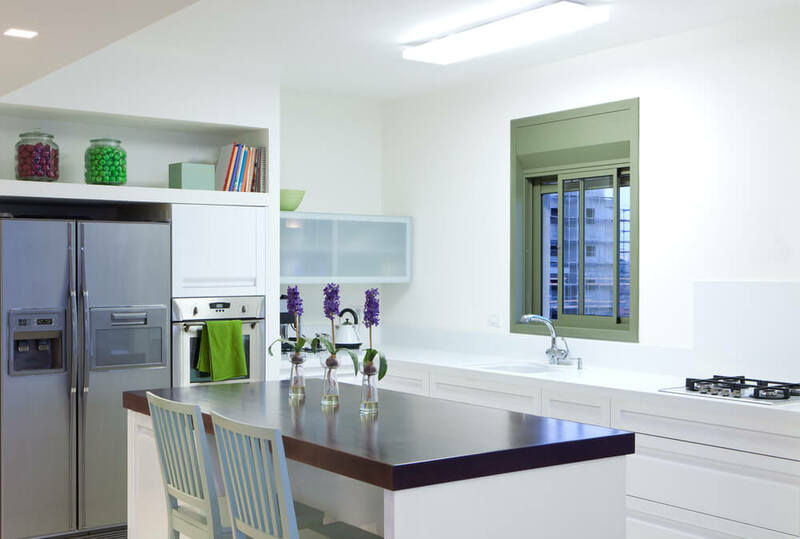 The addition of a colorful window frame breaks the expanse of white in this modern kitchen space. 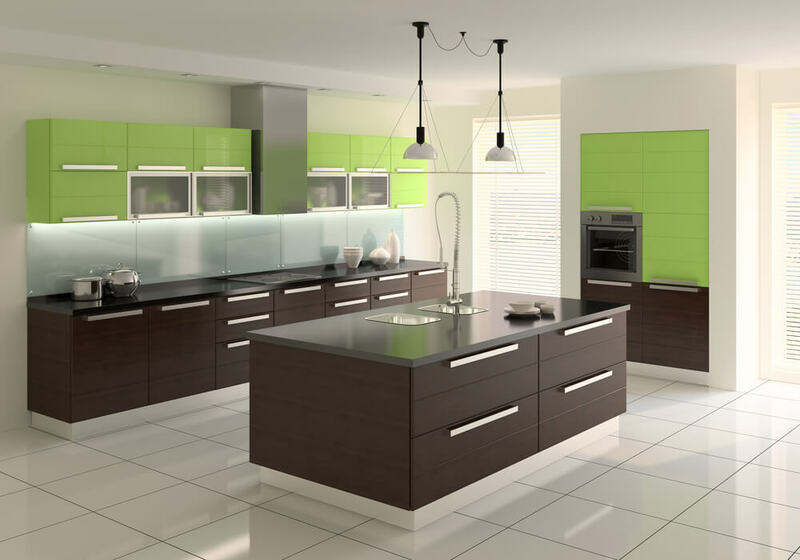 Make certain that you love green when choosing cabinetry in this vibrant color. This tiny kitchen maintains its classy feel by featuring glossy, beveled subway tiles and flat-paneled cabinetry. 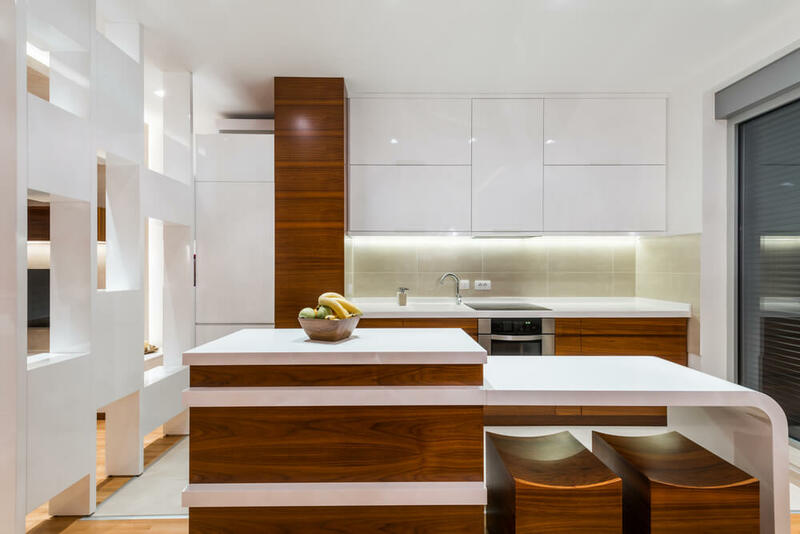 The vertical back splash installed adds to the originality of this contemporary kitchen. The under mount sink in this kitchen provides a clean look and makes meal preparation and clean up easier. 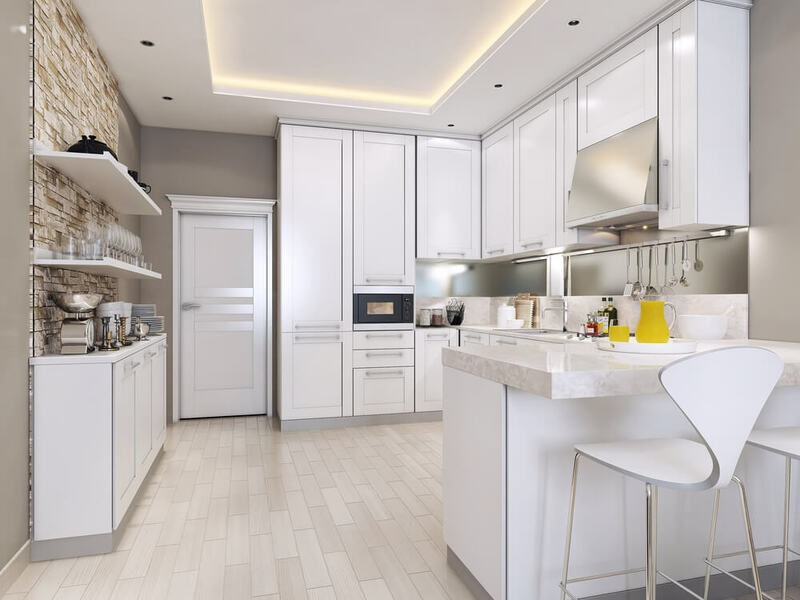 When cabinetry is installed to the ceiling it creates the illusion of additional ceiling height while adding to the practical, functionality of the space. 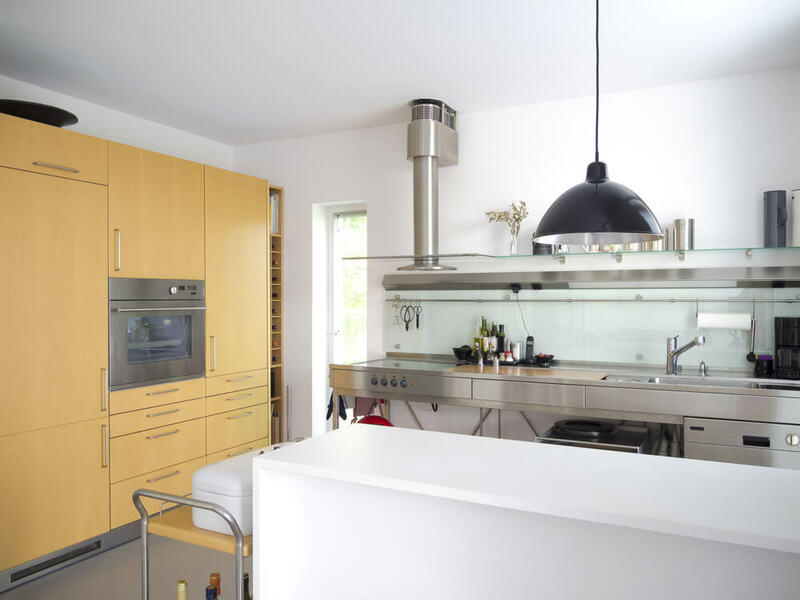 This range hood almost disappears against the solid, white backdrop and white cabinetry. 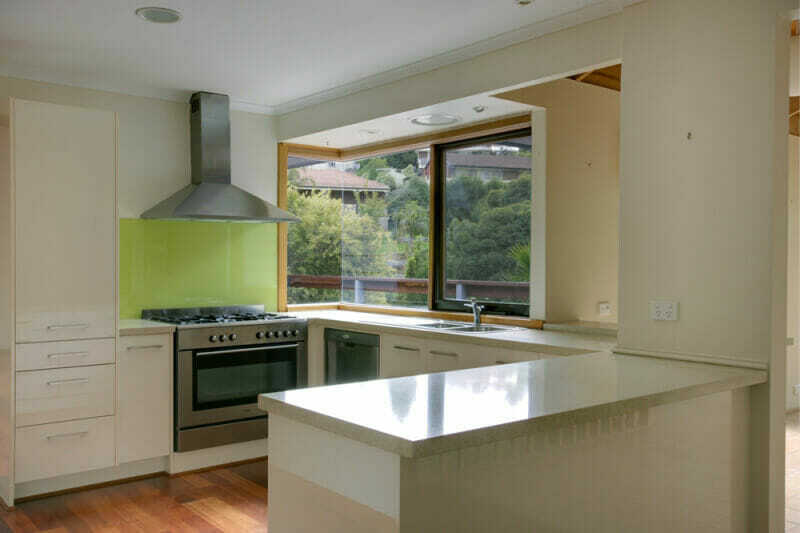 The sky blue and lime green accents add a retro touch to this modern kitchen. 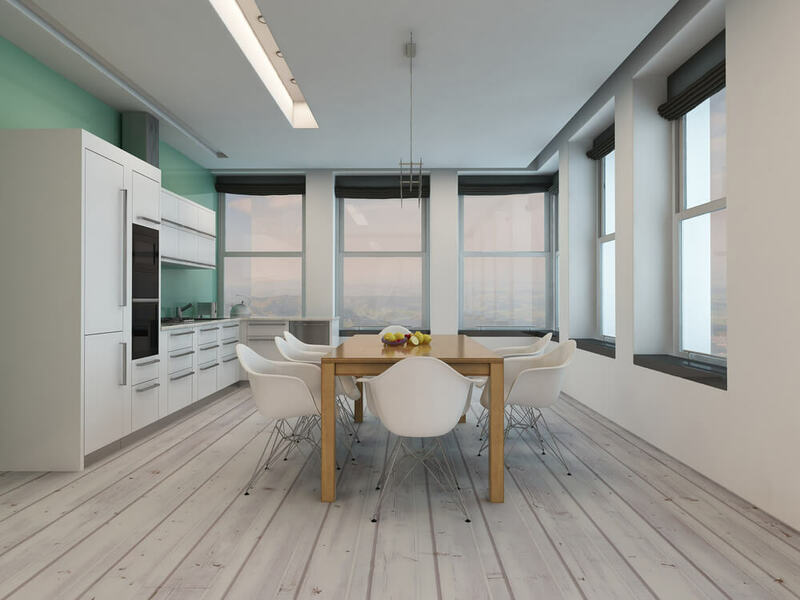 This loft kitchen is designed to maximize the length of the space available while providing clear sight lines throughout. 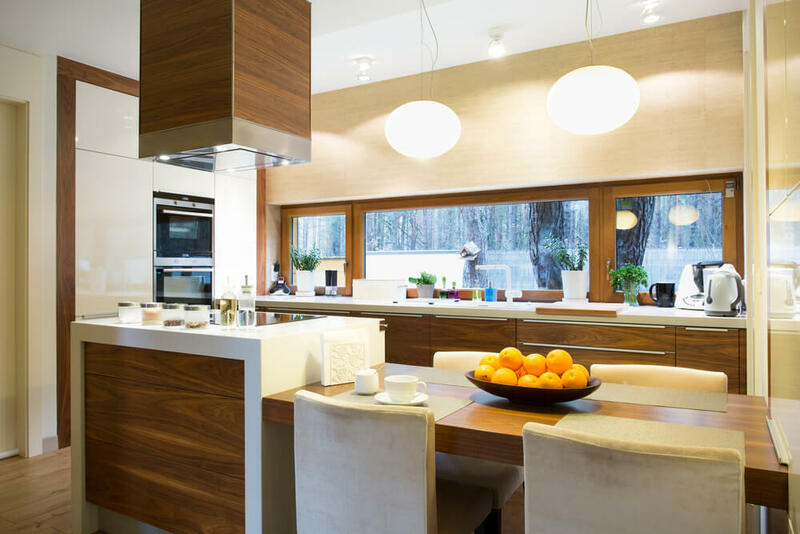 This modern kitchen contains a touch of zen by the inclusion of horizontally, paneled lower cabinets and wooden blinds. 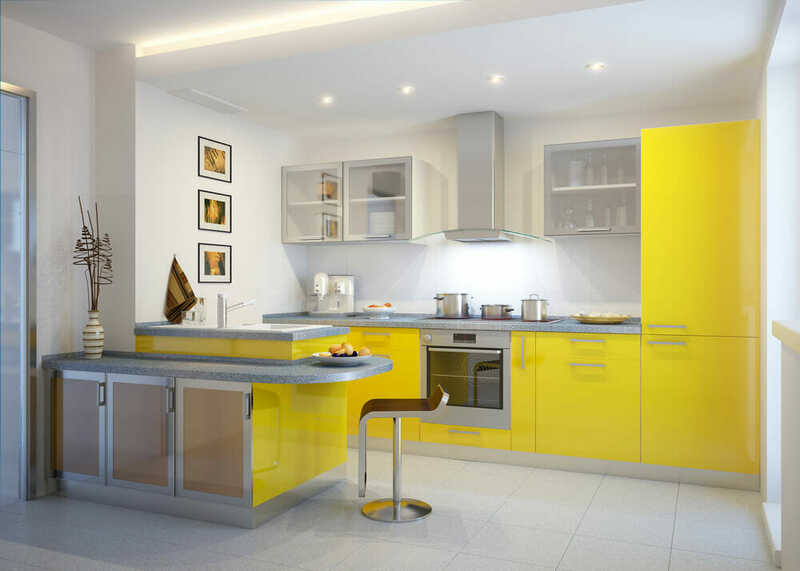 This bright, yellow kitchen is designed for those who are willing to be adventurous when it comes to kitchen design. The floating shelf located below the row of uppers provides space for small items such as cooking spices and dishware. 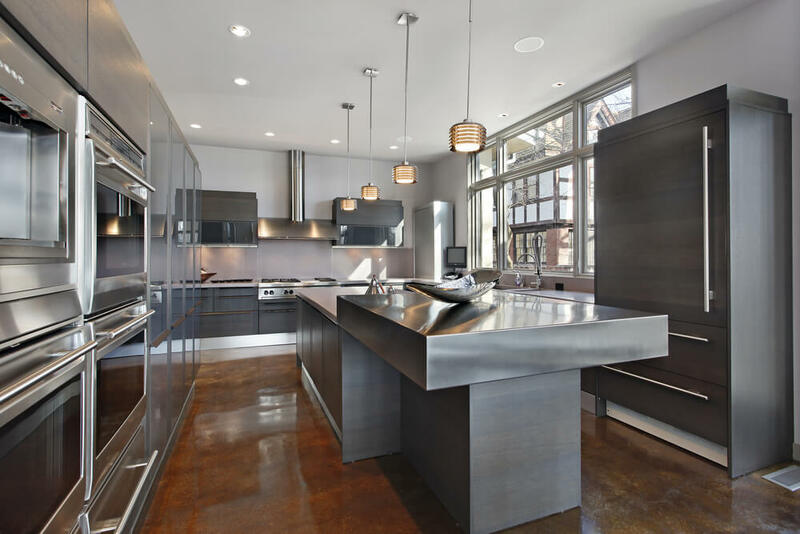 This modern kitchen features plenty of stainless steel to incorporate features similar to industrial kitchens. 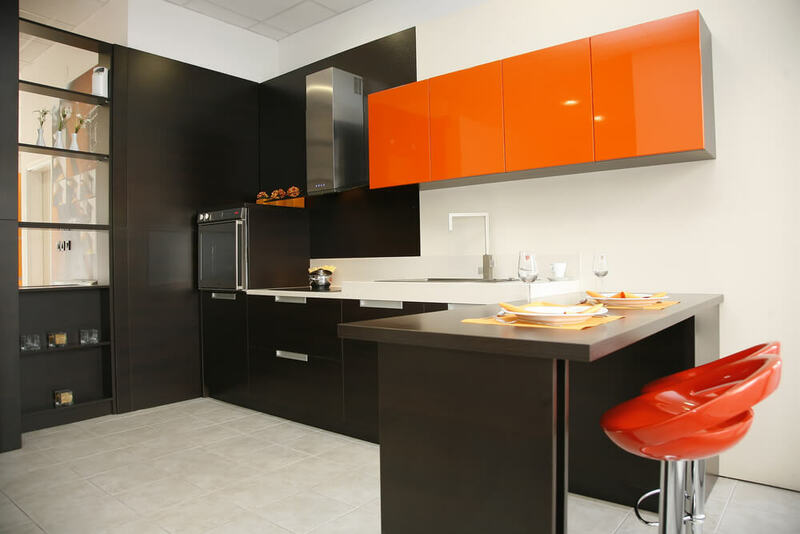 A shock of vibrant orange takes this small, modern kitchen to the next level. 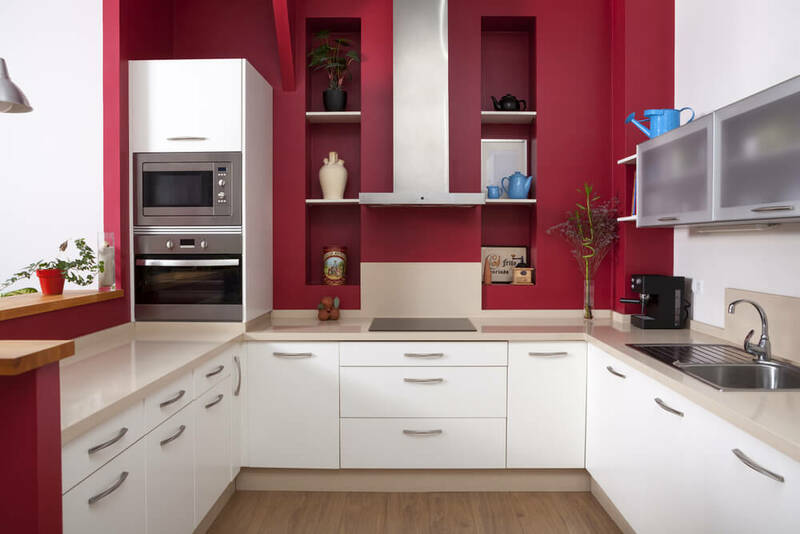 Dark wood cabinetry with hints of a vibrant red are an excellent decorating combination. 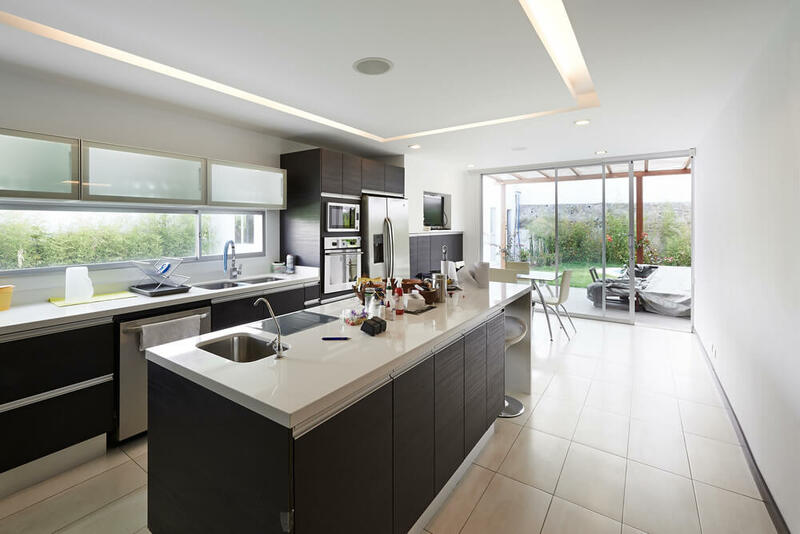 This kitchen is an excellent example of modern kitchen design with it flat-front cabinets and continuous horizontal lines. Built-in floating shelves and lower cabinetry provide the deal place for a homeowner to add personality and color. 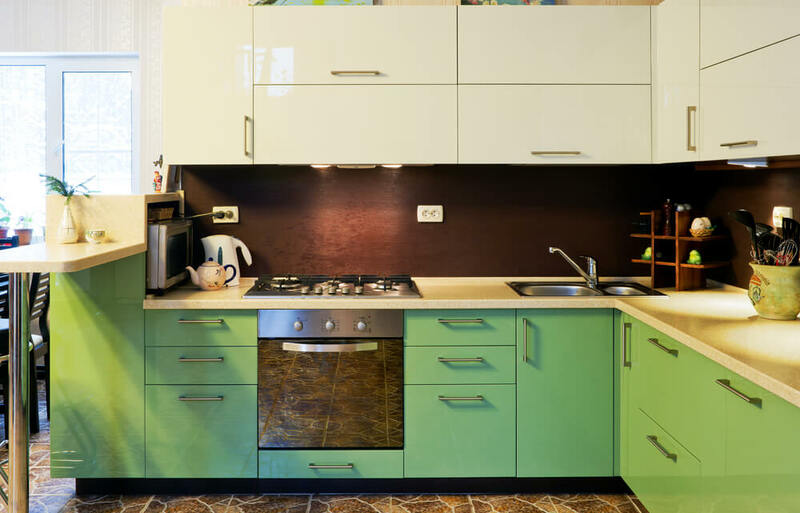 The bright green color of this kitchen’s lower cabinetry takes us back in time . This kitchen provides the perfect balance of open and closed cabinetry while taking advantage of the large, picture window. The finish of these cabinets imbue rustic country while their flat-paneled style is very modern. 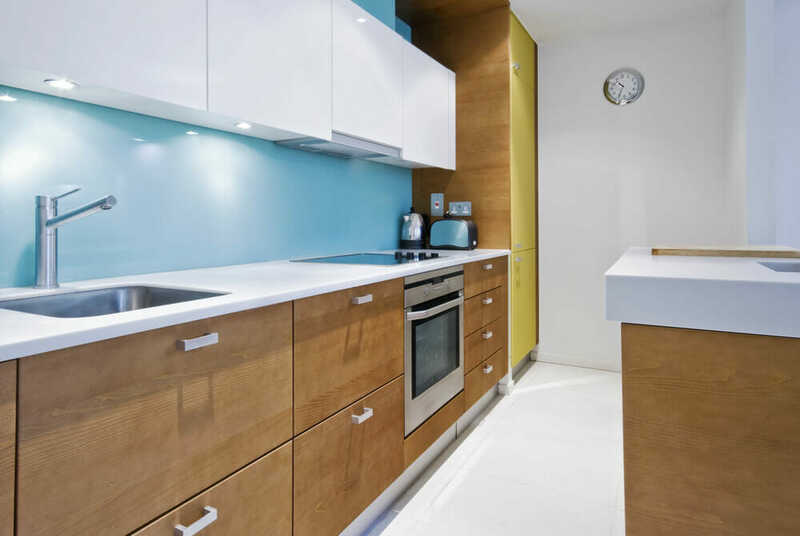 The bright colors of this modern kitchen are sure to wake you up early in the morning. 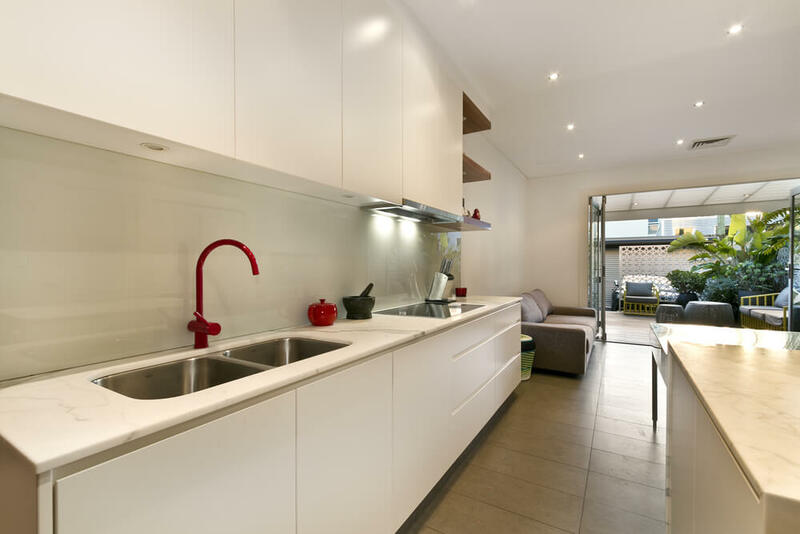 This kitchen layout provides space for cooking and kitchen prep, while offering additional work space. 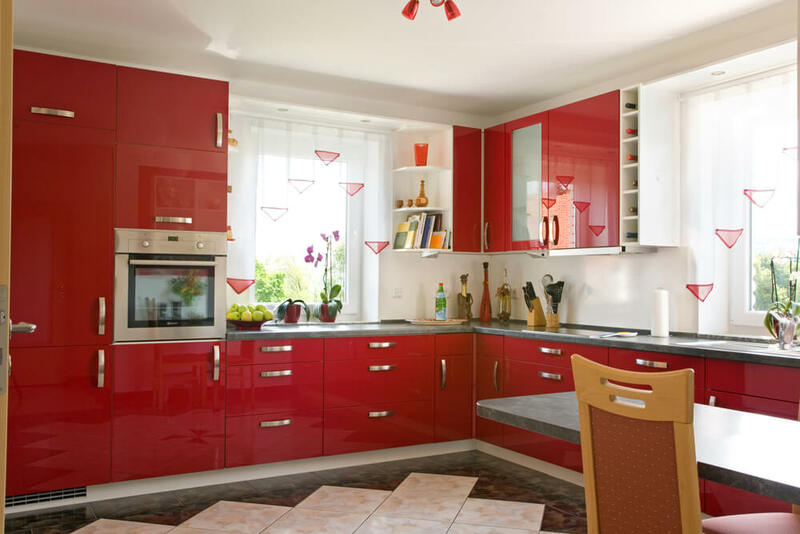 Cherry red is a cabinet color that is sure to catch your eye and provide a great place to start conversation. 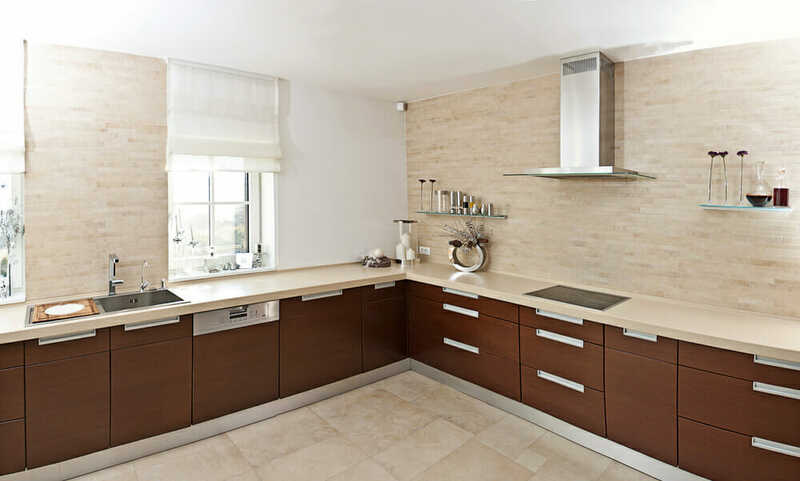 A single, line of stacked tiles above the cook top provide a simple focal point and reference the dark brown of the lower cabinets.